The days have lengthened enough now so I can once again get outside after work and that’s always a relief. Having to take enough photos on a weekend for two blog posts can be a challenge, especially when it rains or snows on one of those weekend days. 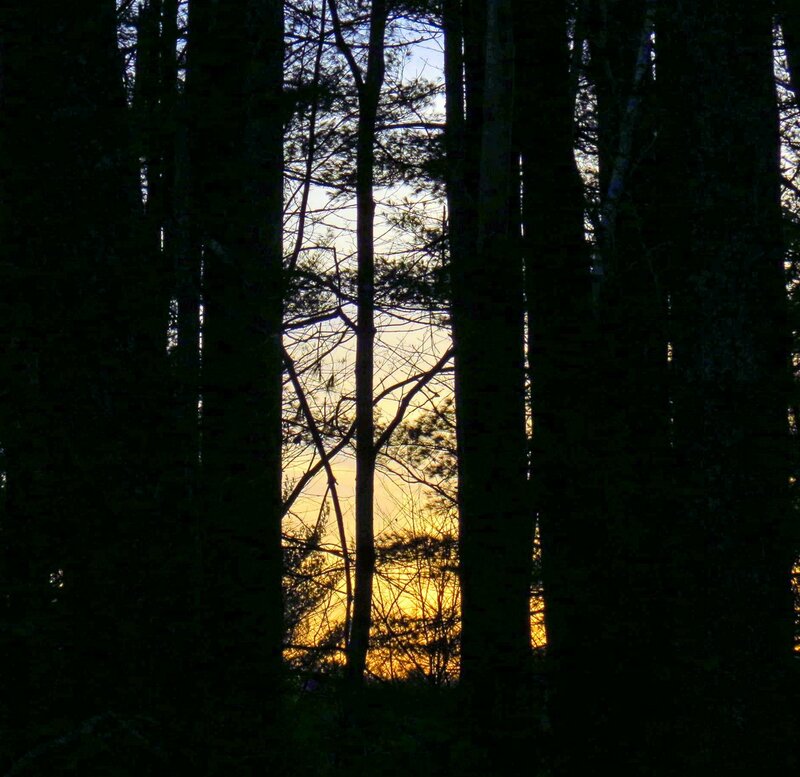 It gets dark at about 5:30 pm now and that means an hour or so to get into the woods. Not much time, but when you live in the woods you don’t have to go far. On this day I chose a bit of woodland near my house that has an old dirt road running through it. 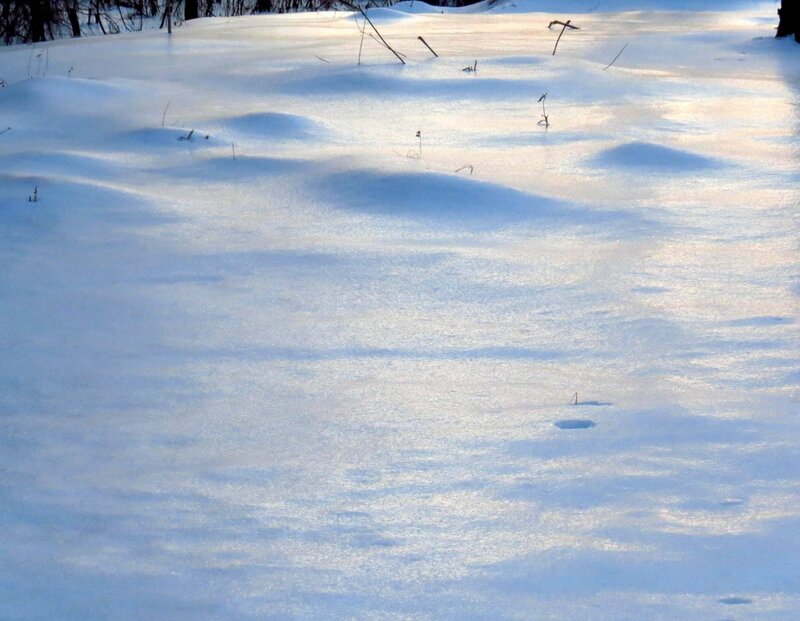 The sun was low and the light was just right to show you the shiny ice that covers the snow. 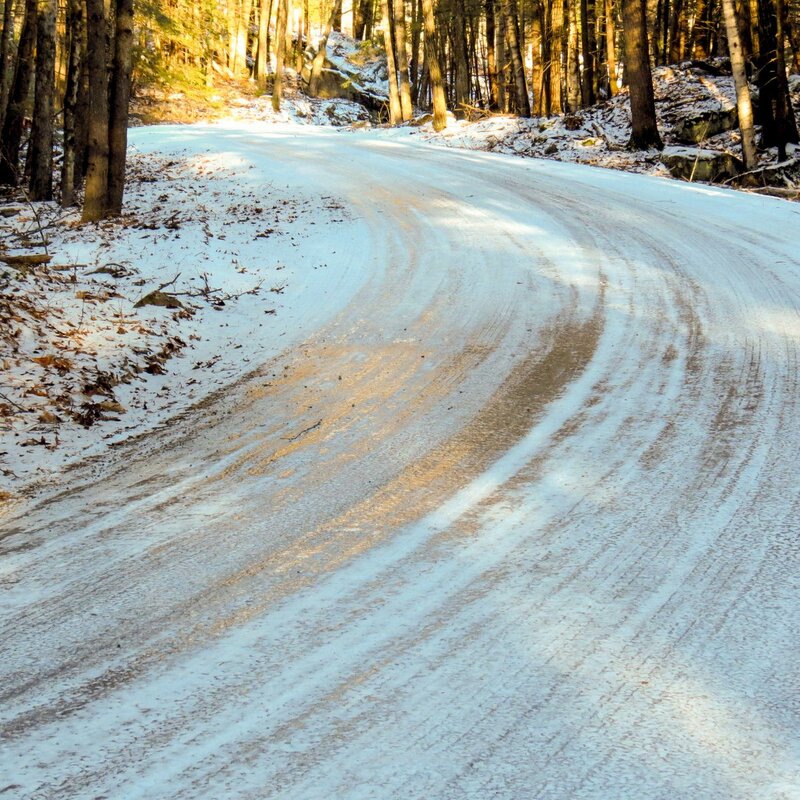 This ice makes breaking a trail through the snow difficult, at best. I can remember how hard it was even at 10 years old. 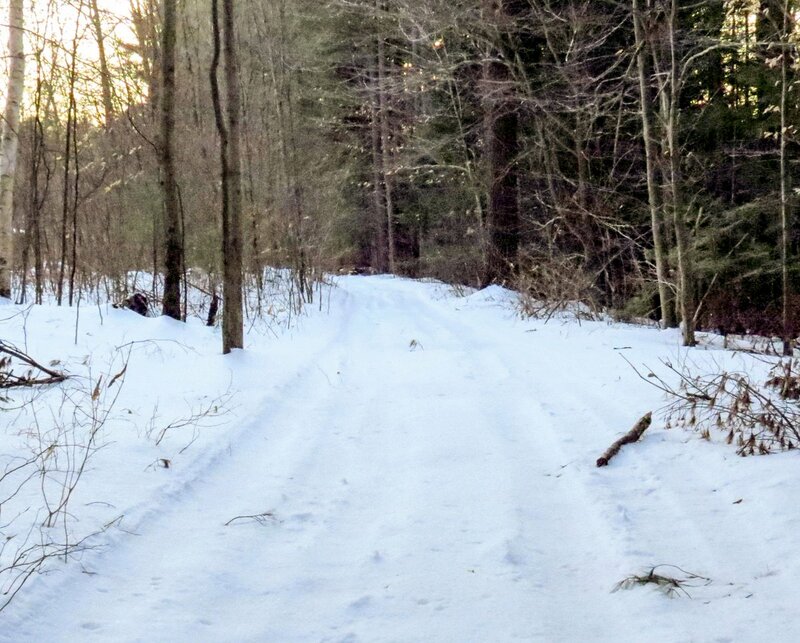 But someone had driven down this old road with a 4 wheeler or something and that broke the icy crust and packed down the snow, so walking here was a breeze. A young white pine (Pinus strobus) had fallen across the road and someone had come along and cut it up. 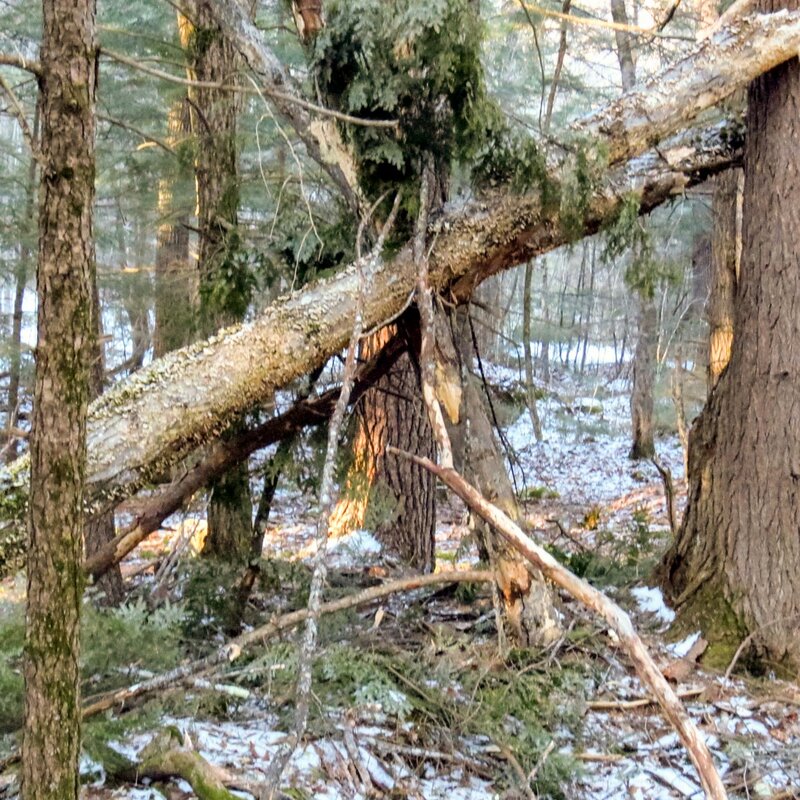 We’ve lost a lot of trees to the wind this year but most were dead or dying. This looked like a healthy young tree. There is a small stream out here that feeds into a large swampy wetland. 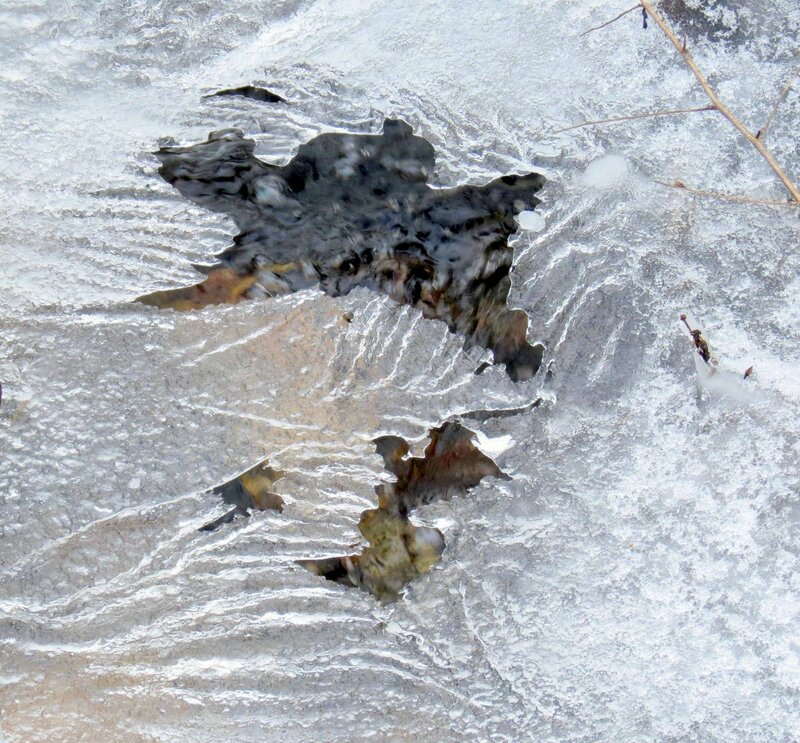 I was surprised to see it so free of ice. 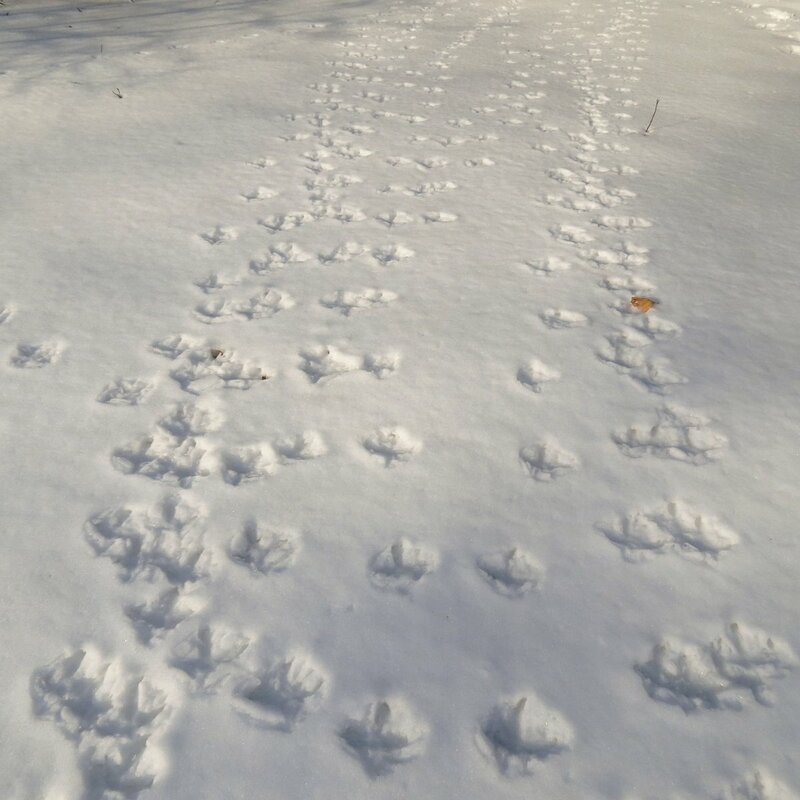 It was obvious that a large flock of turkeys had been through here. Turkeys are very active in winter and I see them everywhere, but I always seem to be driving at the time so getting photos has proven harder than it should be. 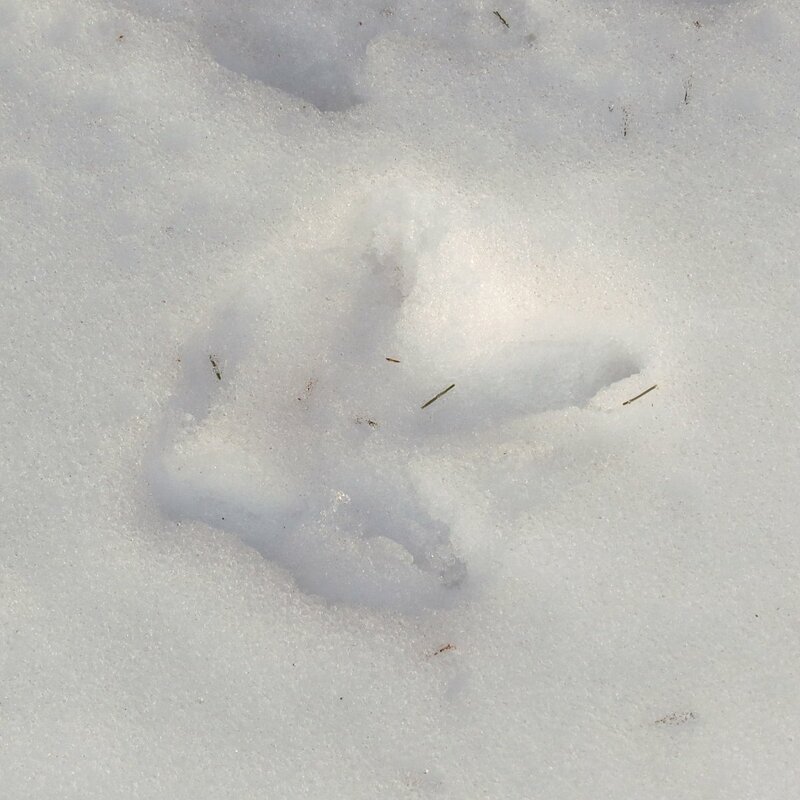 Turkeys have big feet that they use to scratch up forest litter with as they look for food. 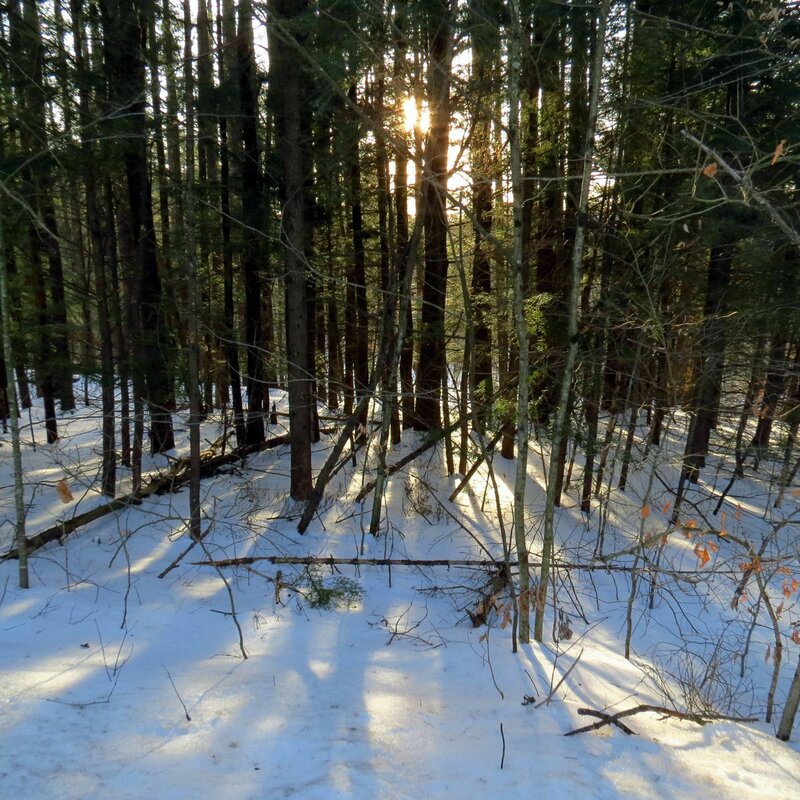 They’ll get under a stand of evergreens where the snow is thin and scratch up large areas looking for acorns, beech nuts, grapes, or berries they’ve missed on previous hunts. When spring comes they’ll eat buds, fresh grasses, roots, and new leaves. In summer they’ll eat a lot of insects, including ticks. 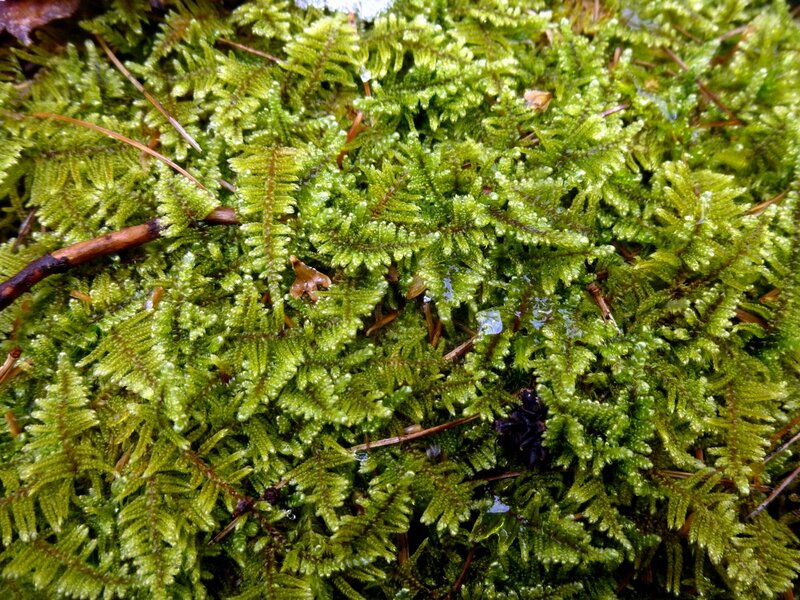 Mosses look so delicate but they’re very tough and will weather the ice and snow like it wasn’t even there. This is one of my favorite mosses. I like the way its fingers reach out to find new spaces to grow in. Though there may be snow everywhere you look winter can actually be a very dry season, and this moss was so dry it’s hard to tell what it is but I think it might be brocade moss (Hypnum imponens.) Brocade moss is often very shiny and can have an orange brown color. Its common name comes from the way it looks as if it has been embroidered on whatever it grows on. 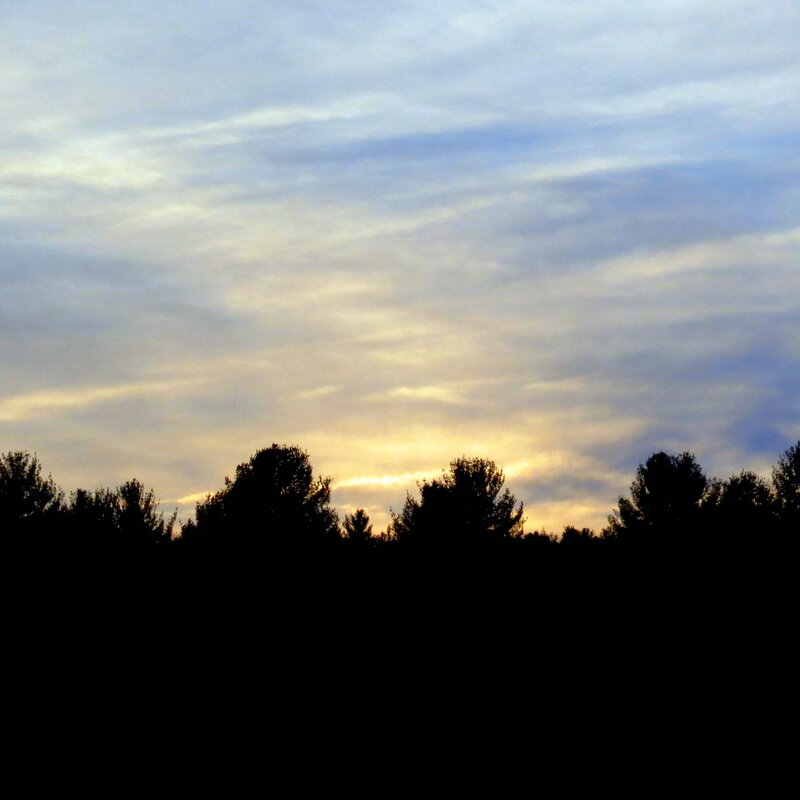 As I stopped to take photos I could hear a pine tree creaking as a breeze blew it gently back and forth. It was easy to believe that the sound would be the same on the deck of a wooden ship but it would be the mast creaking there, rather than the tree that it was made from. 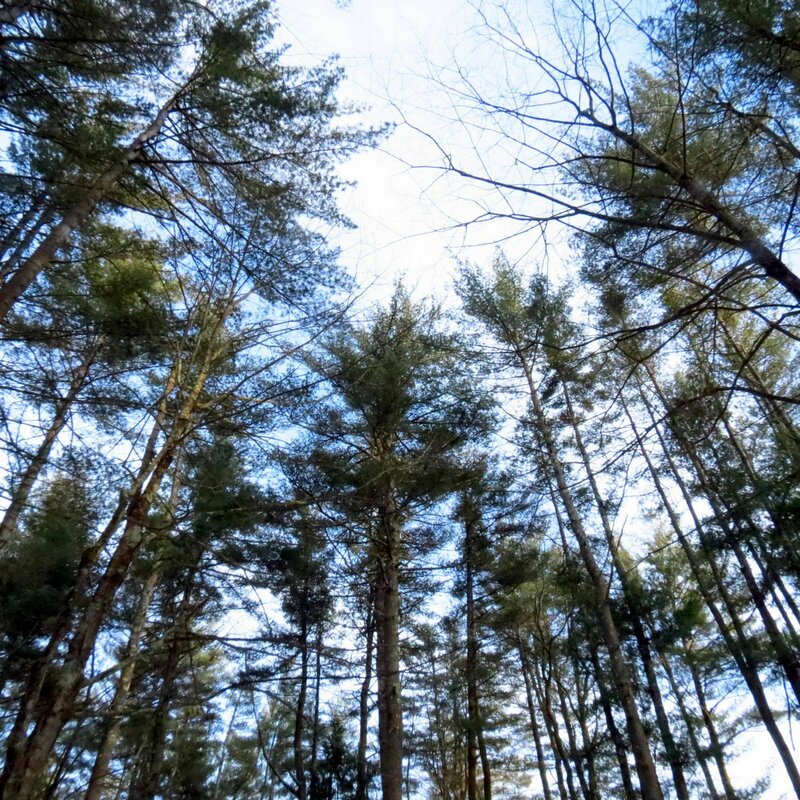 When this land was first colonized tall, straight pines were prized by the Royal Navy, and cutting any tree marked with the King’s broad arrow mark meant certain death. 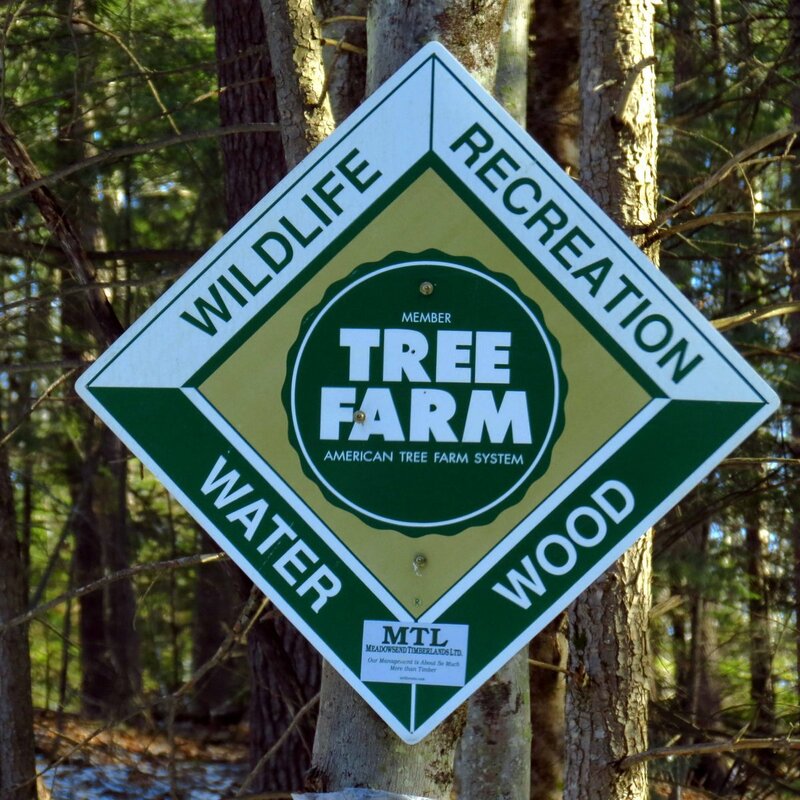 The trees became known as mast trees and the practice of the King taking the best trees led to the Pine Tree Riot in 1772. 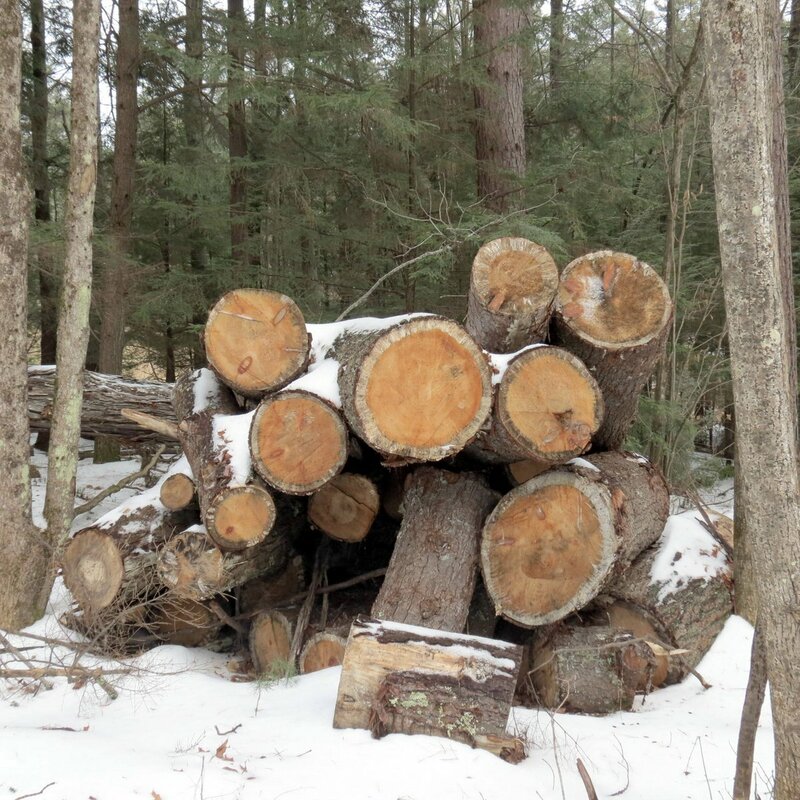 In an open act of rebellion colonists cut down and hauled off many marked mast pines in what was just a taste of what would come later in the American Revolution. 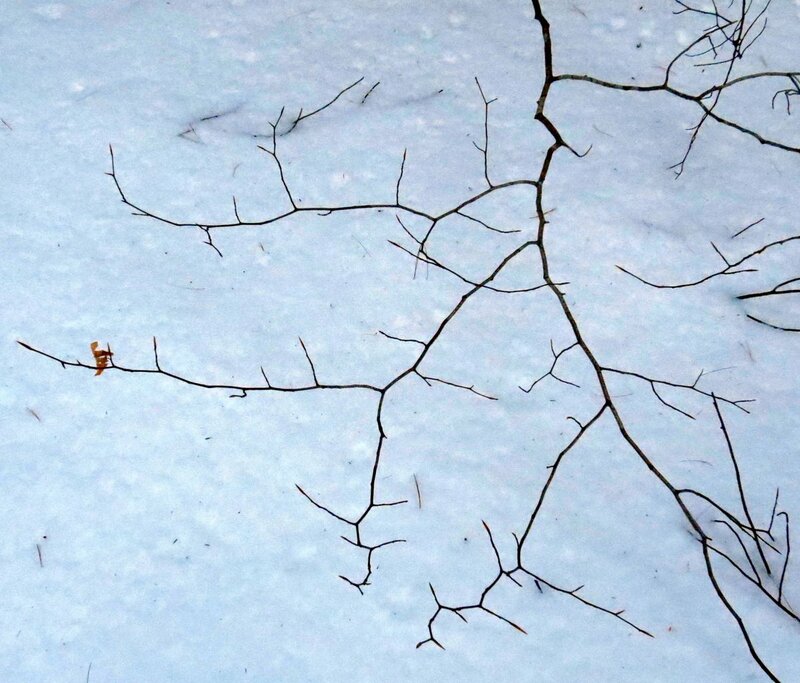 I stopped to admire the structure of a beech branch that stood out so well against the snow. Each twig is placed perfectly so one leaf doesn’t block the sunlight reaching another. A golden puddle on the road told me the sun was quickly getting lower in the sky. This time between day and night is when the night creatures take over. 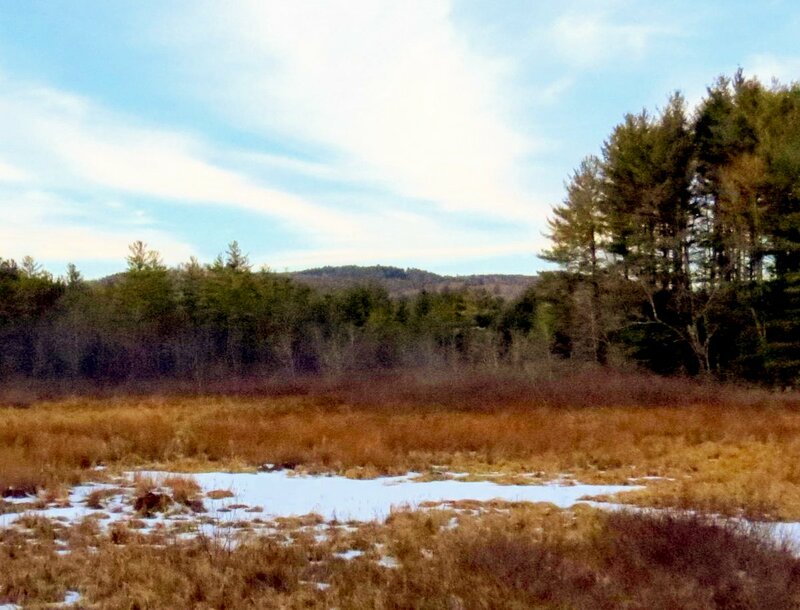 I know this area well and I’ve seen some big bears near here but, though I’ve seen skunks coming out of hibernation already I doubt the bears are awake yet. It won’t be long though. 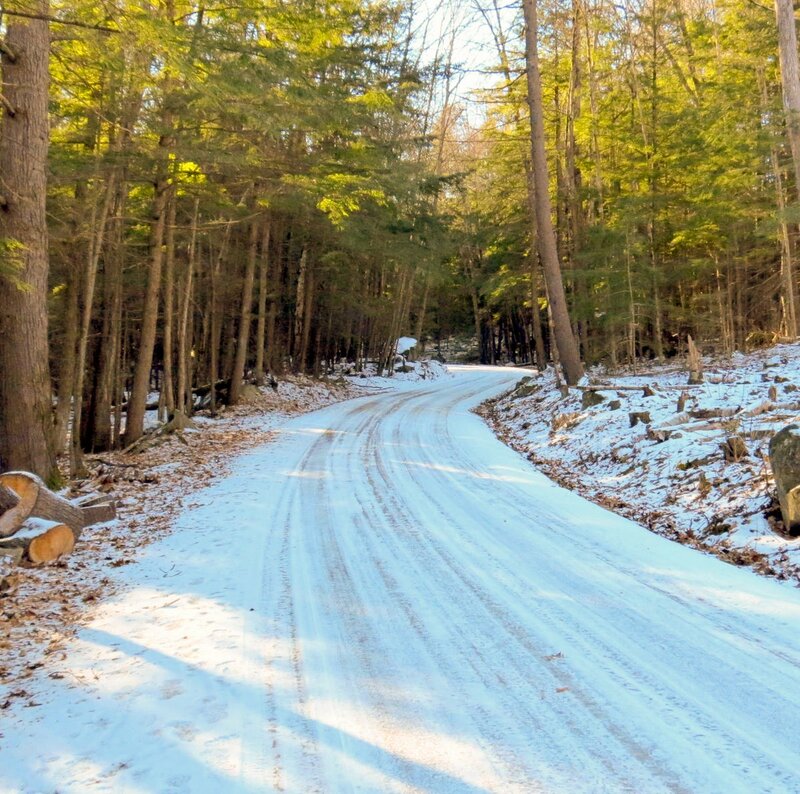 The old road leads to and around a large swamp. The breeze blew stronger here in this big open space but it was still fairly warm for February. It’s easy to imagine voices on the winds in such a place, whispering softly. For me it’s a peaceful, comforting sound but sometimes it can be a lonely one. I’ve heard that the wind drove early settlers on the Great Plains to madness but I think it was the loneliness more than the wind. It was the voices on the wind, sometimes whispering and sometimes howling, that told them how alone they really were. With a phone in my pocket I could talk to anyone anywhere at any time but they could not. Marty Rubin once said solitude is where one discovers one is not alone, but solitude is experienced differently by different people. For me it is simply a part of who I am and it brings me great joy, but I can understand how it might seem like a burden to others. The southwest side of this sugar maple had sunscald, which is very different than frost cracking. 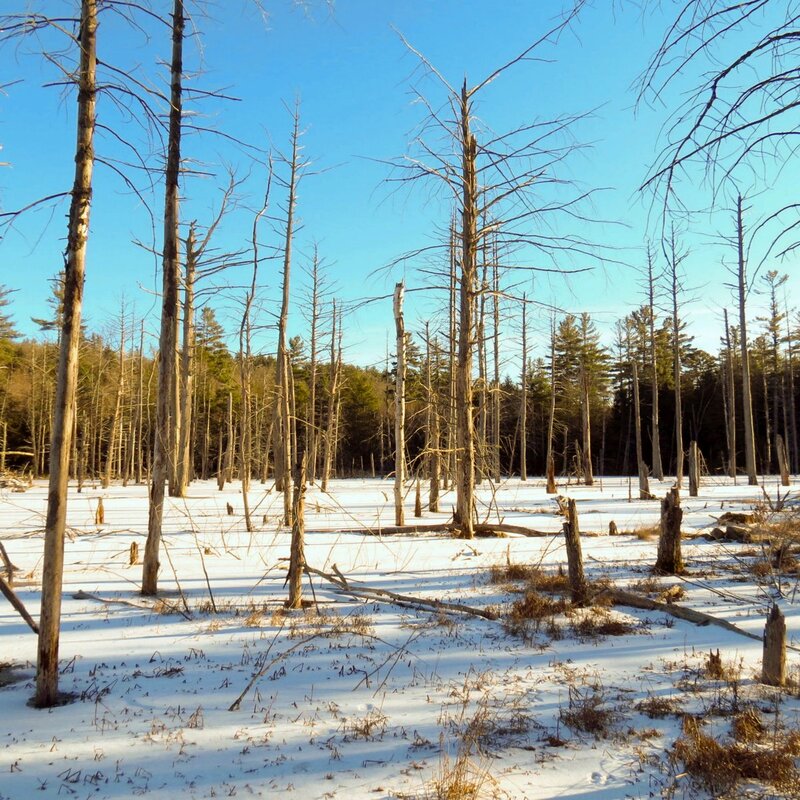 Sunscald happens when southwest facing bark freezes at night after high daytime temperatures. 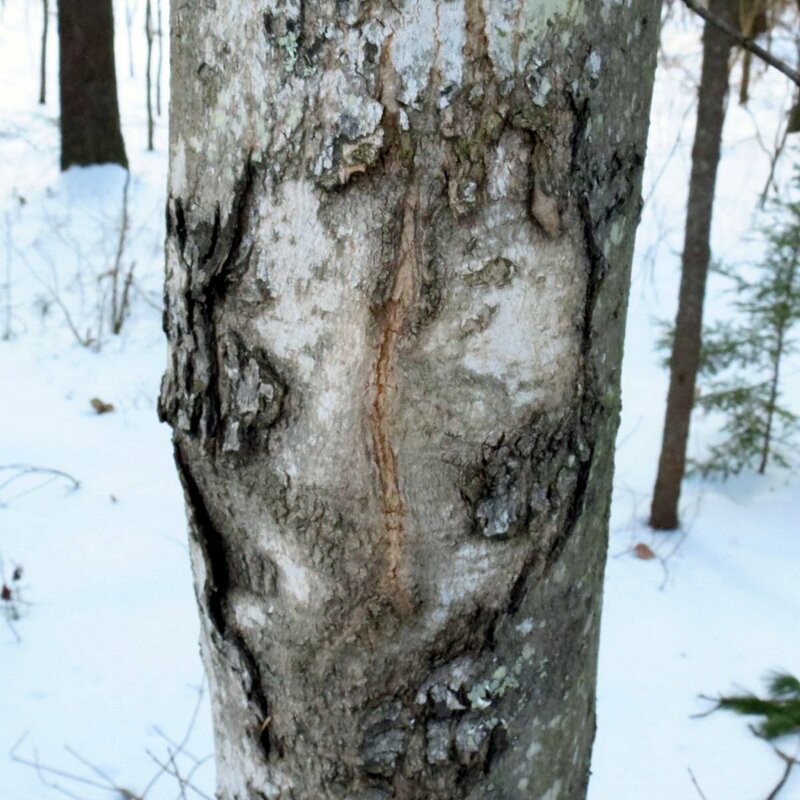 Direct sunlight or sunlight reflecting off the snow can heat the bark during the day and bring it out of dormancy, and then when it freezes at night the active tissues are killed, resulting in the kind of wound seen here. 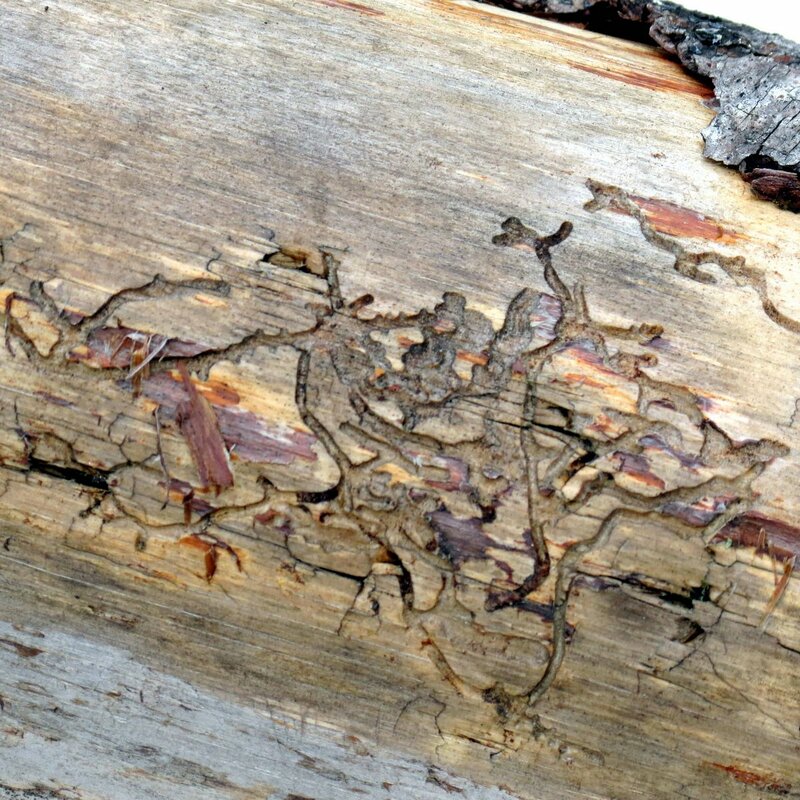 Cracking and peeling bark is a sure sign of what is also called southwest disease. If this were a frost crack the crack in the bark would be absolutely vertical. This one curves like a snake and the dead bark around it covers a large area. I’ve never seen witch hazel (Hamamelis virginiana) blossoming out here but here was a large shrub with the telltale cup like bracts on it. 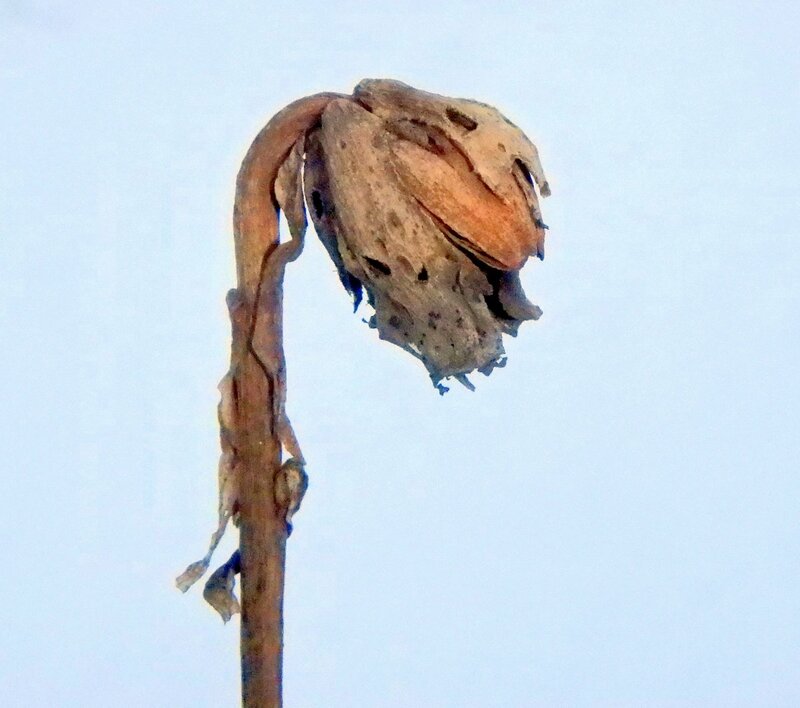 It even had the petals still coming out of the bracts but they were still there from last fall and were frozen. Native witch hazels can bloom on a warm day in January but I’ve never seen one blooming this late. 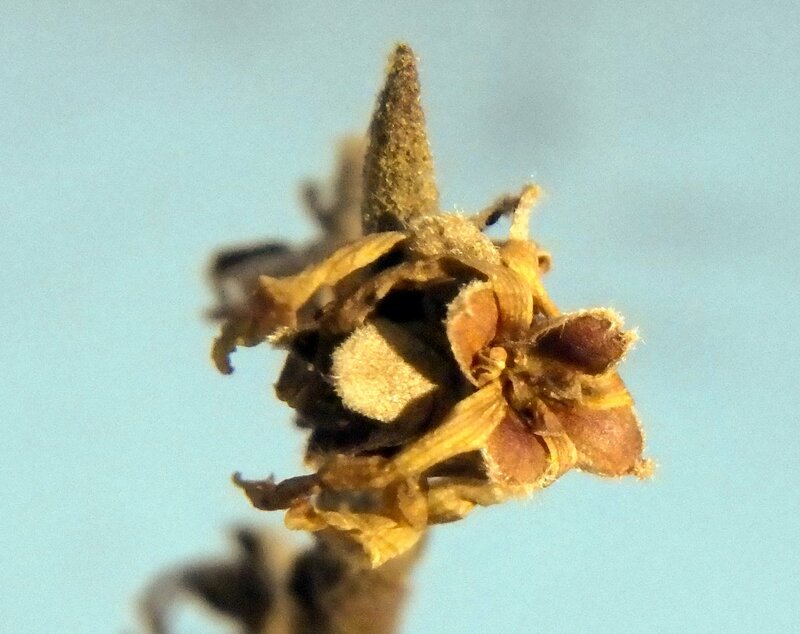 The spring blooming vernal witch hazels (Hamamelis vernalis) will be starting to bloom any time now. Indian pipes (Monotropa uniflora) are white and ghostly and grow in the dark places in the forest. They can get away with doing that because they don’t photosynthesize, but they do have flowers and when the flowers are pollinated they stand straight up from the shepherd’s crook shape seen here. This tells me that the flower seen here either wasn’t pollinated or didn’t see any need to stand up straight like all of its cousins. The seeds are fine like dust and I think the flower standing up straight must have something to do with rain being able to splash the seeds out of the capsule. 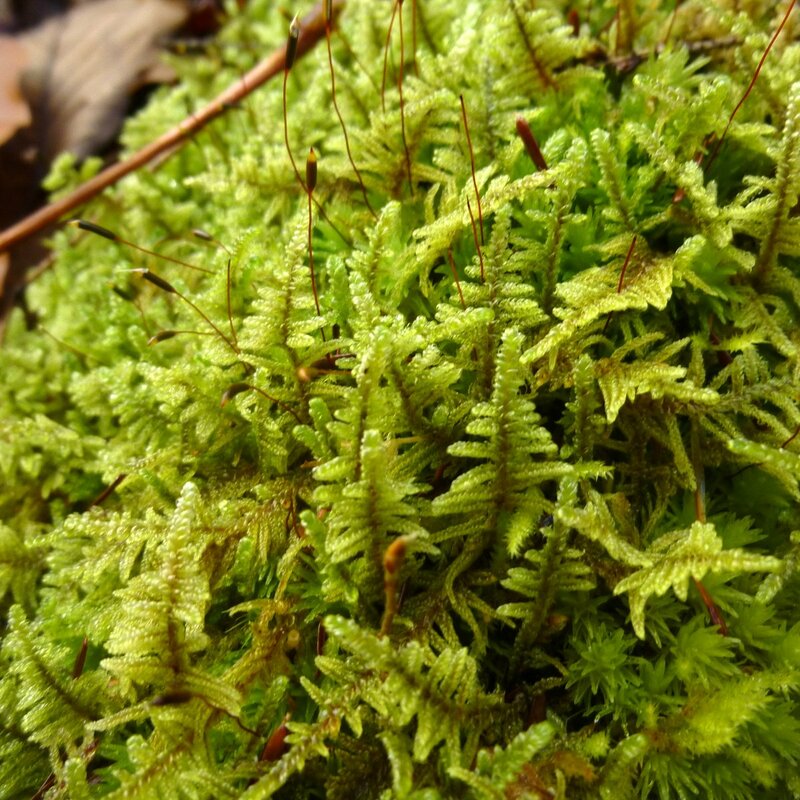 Many plants and mosses use the same strategy for seed dispersal. Fresh Indian pipe plants contain a gel that Native Americans used to treat eye problems, and the common name comes from the pipes they smoked. This is what the stained glass looks like in the cathedrals I visit. 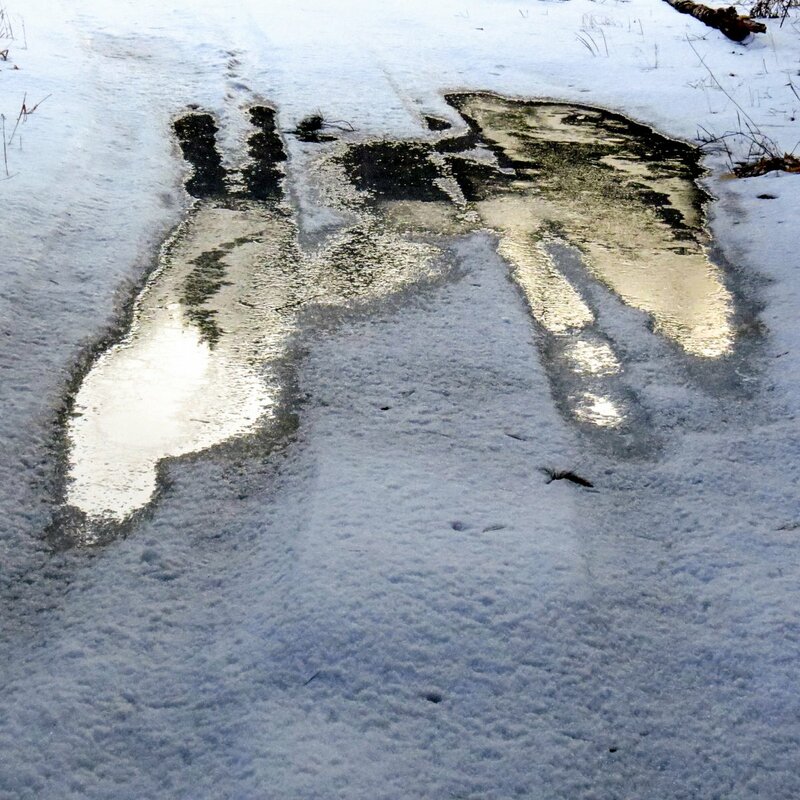 I followed my own footprints back down the old road and saw how they meandered from this side of the road to that; a puddle of footprints where I stopped to admire something. This is how it should be for one who studies nature; meander like a toddler and be interested in everything. You see all the small, hidden jewels of the forest that way. 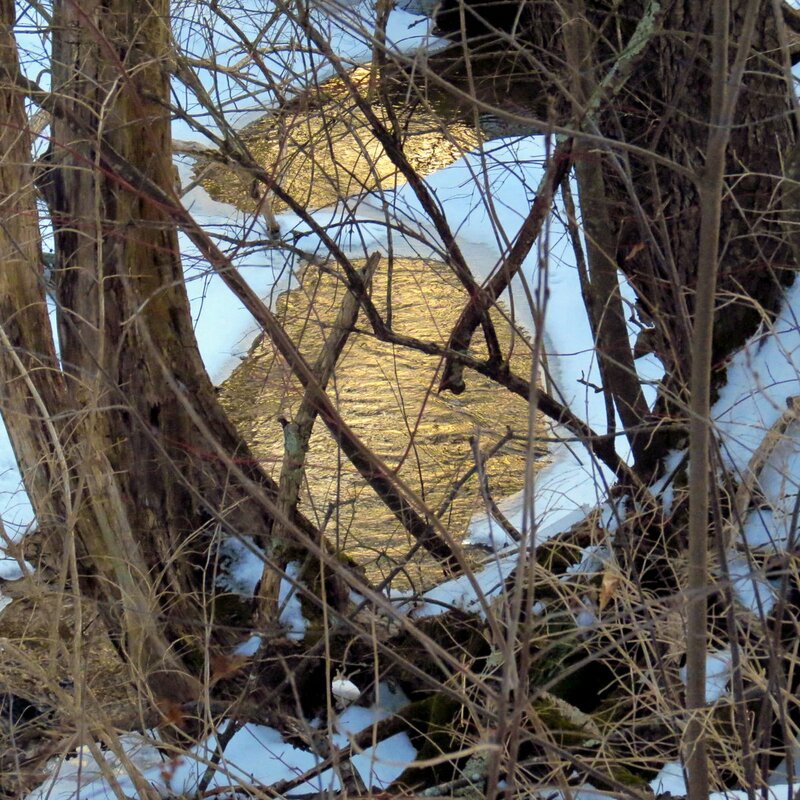 And find joy in the beautiful, simple things that make you smile, like a stream of molten gold weaving its way through a forest. All this beauty, all this wonder, is right there in my back yard, and it’s in yours as well. I hope you’ll have a chance to get out and see it. Note: This is part two of a two part post. If you’d like to see part one you can scroll down to it. 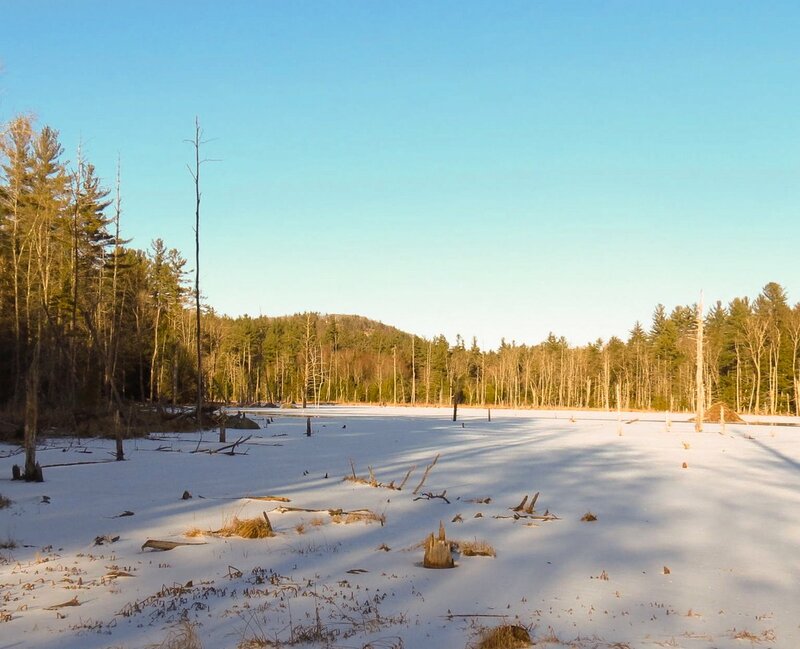 If you walk long enough on the old abandoned road through Yale forest in Swanzey you’ll come to an open swampy area that was once home to beavers. 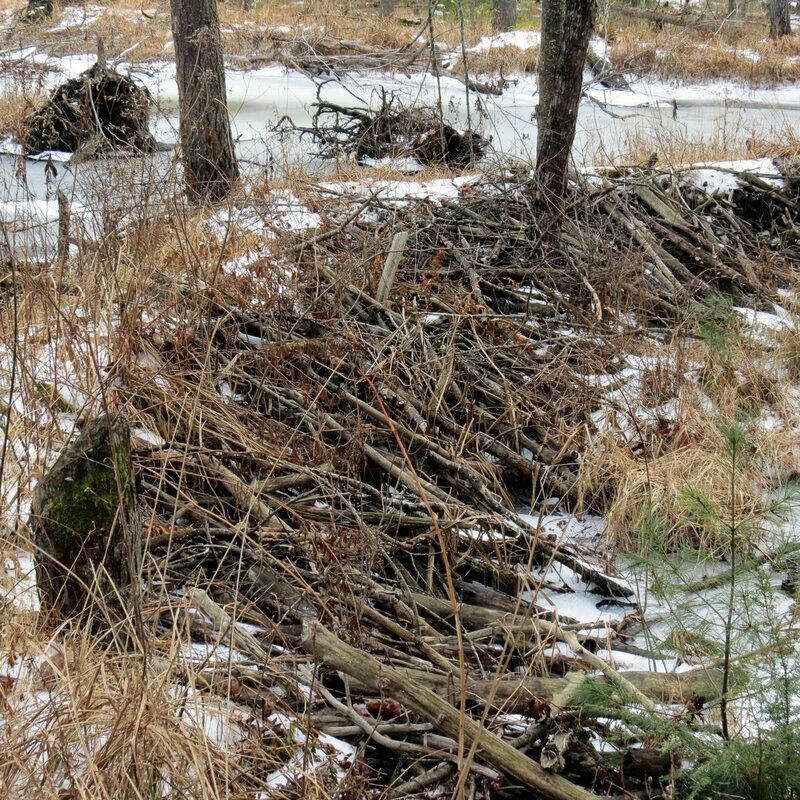 Beavers will move into a place and eat all the trees and then move on. Their pond will eventually drain and new trees will start to grow, and they will move back again to repeat the cycle. I’ve read that it takes about thirty years to go once around the cycle and this area looks as if it’s in the beaver pond draining stage. 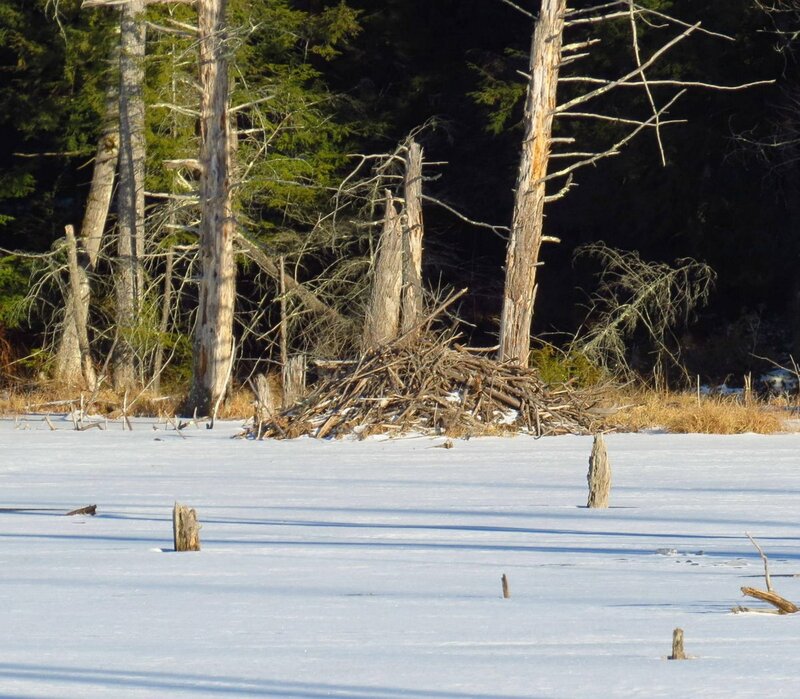 Now trees need to grow so the beavers will come back. The above photo shows the old dam which isn’t really holding back any water now, judging by the force of the stream that runs through here. 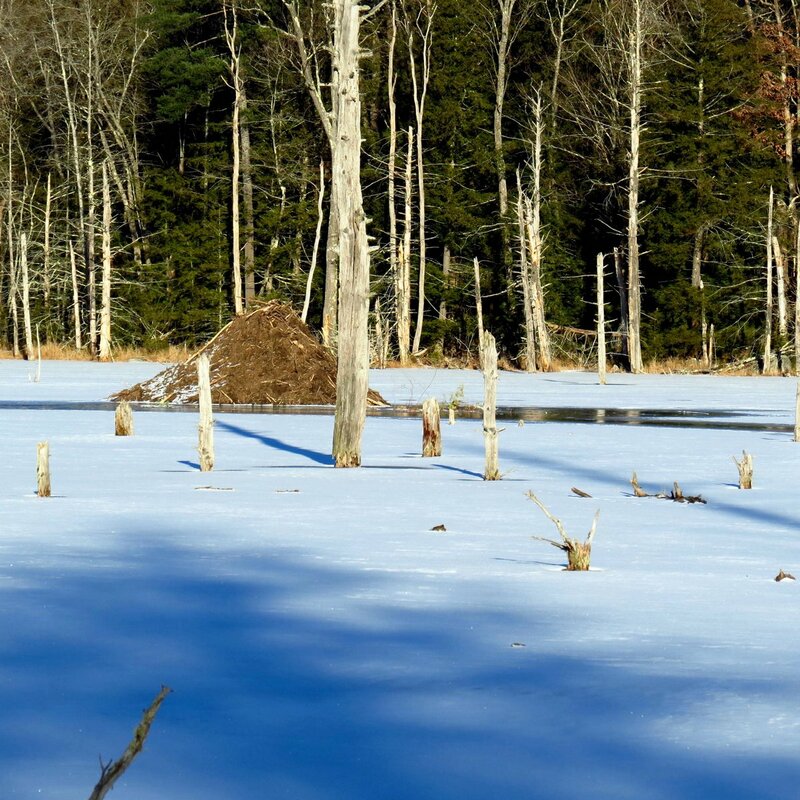 The height of the embankment in the background of this photo shows that the beavers chose a natural bowl shaped area for their pond, but the grasses in the foreground show that the pond is now mostly dry. This is another look at the dam. It was long but not real high; maybe 4 feet. I’ve seen them high enough to be taller than I am, holding back an incredible amount of water. The biggest beaver dam on record is one in Wood Buffalo National Park in Alberta, Canada that is 2,790 feet long and can be seen in satellite footage from Google Earth. Explorer Rob Mark was the first human to reach it in July of 2014. 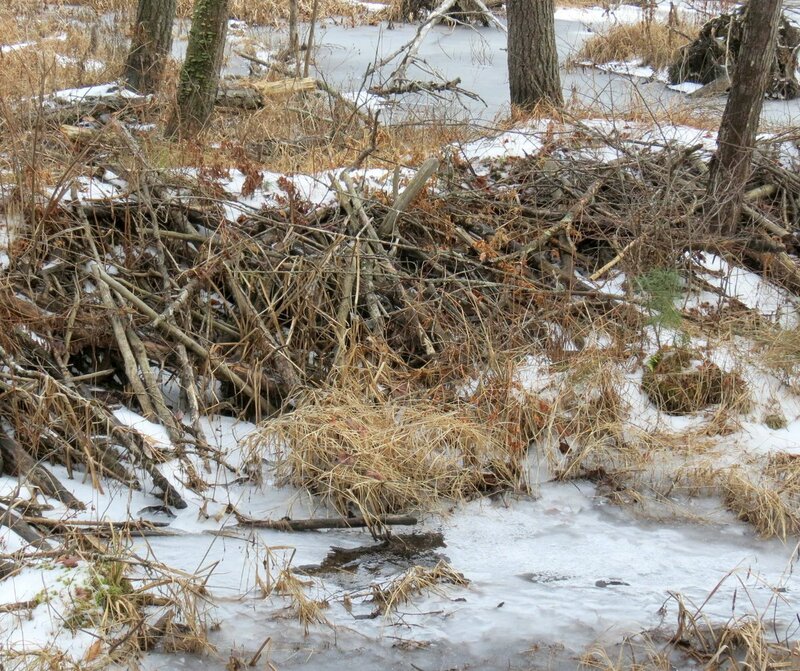 I hope I’m never near a beaver dam if it lets go. 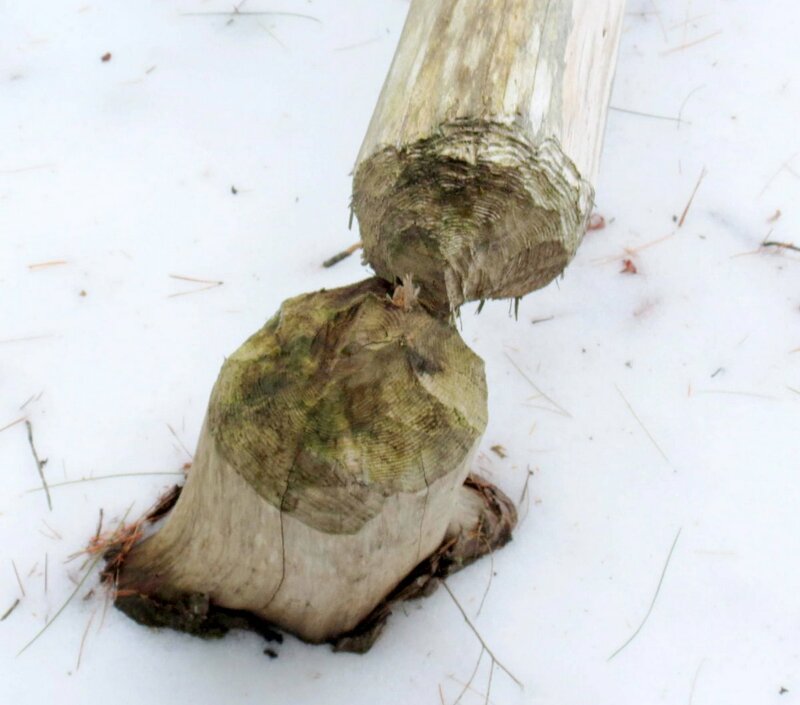 There was plenty of evidence of beaver activity but it happened a while ago. 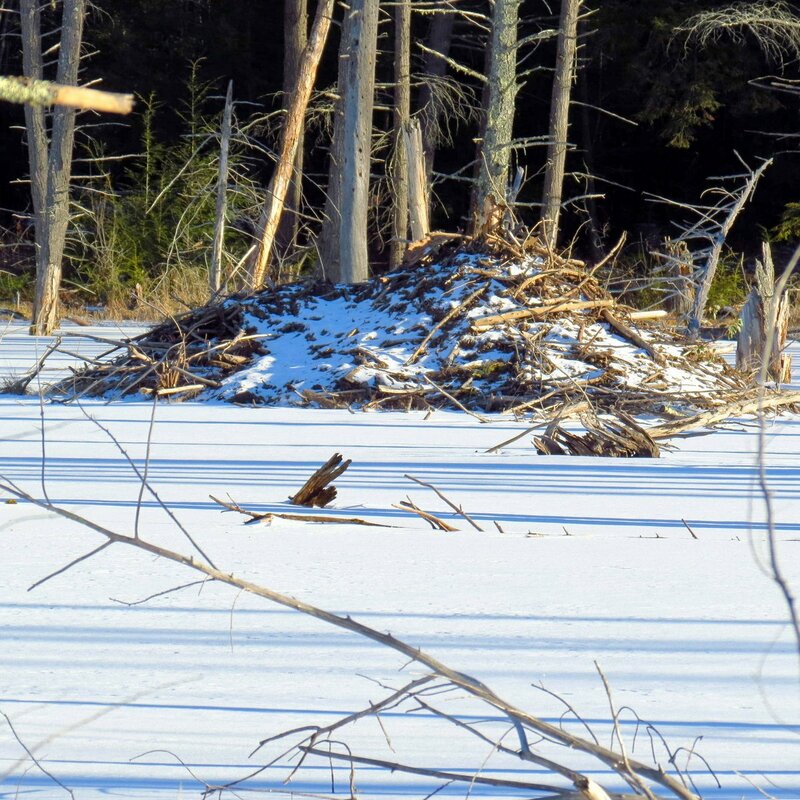 This beaver stump is beginning to blacken, as were all the others I saw. Tree cutters of a different kind were also in evidence. I don’t know why they left these logs there. The wood must have been sub-par in some way. 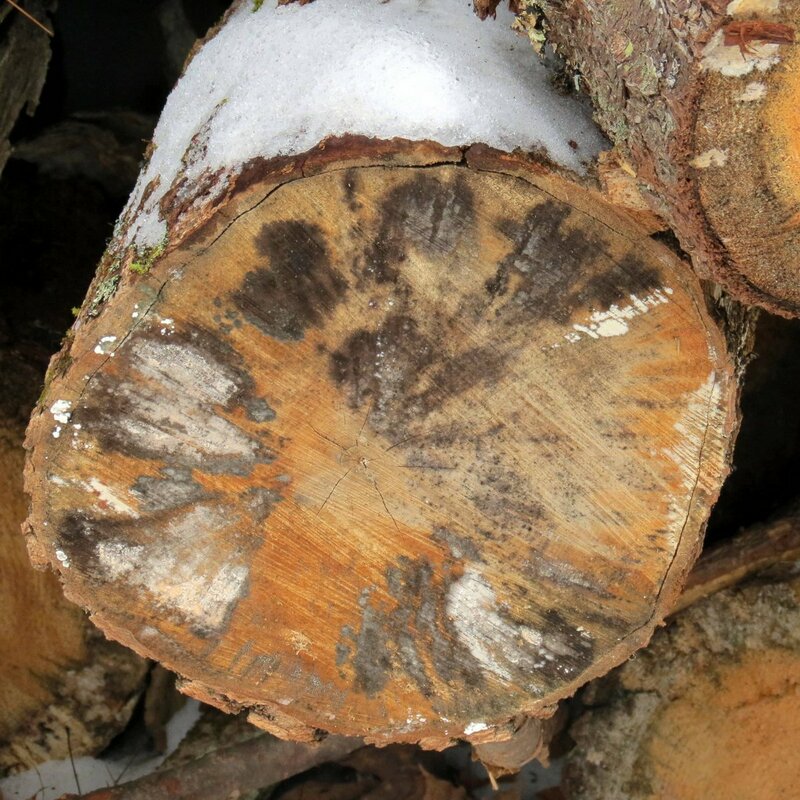 A couple of the logs showed signs of fungus infection. This one had signs of what looked like it might have been blue stain fungus (Ophiostoma,) which is usually transmitted by bark beetles. 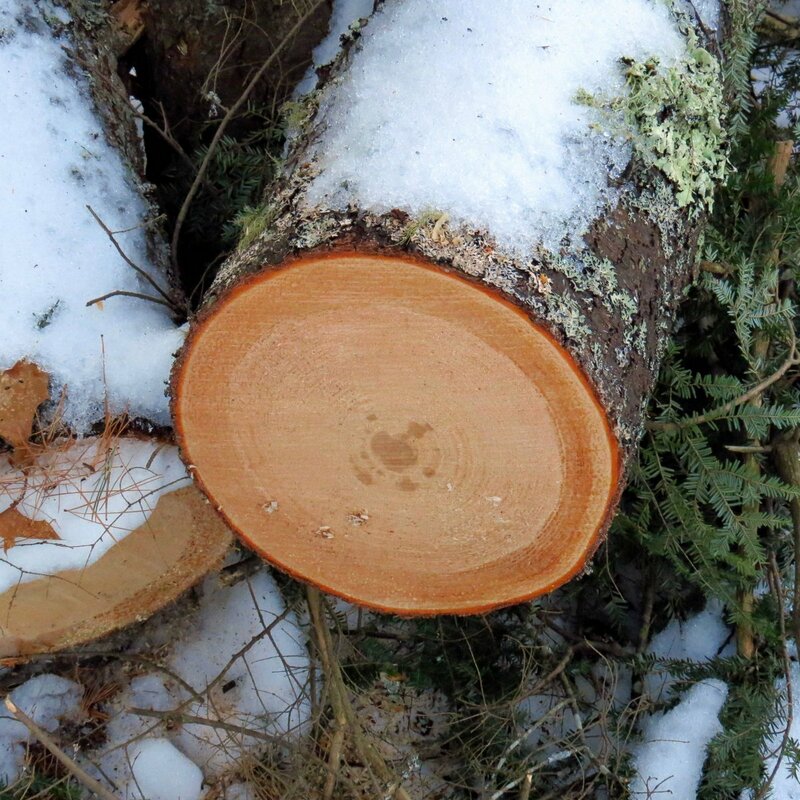 It is also called sap stain because it discolors the sapwood, along with any boards that are cut from it. This lowers the value of the log considerably; possibly enough so it wasn’t even worth the fuel it would take to truck it to the mill yard. There was plenty of evidence of bark beetles on pine limbs. Not only do they transmit disease, if they chew one of their channels completely around a branch it will die from being girdled. 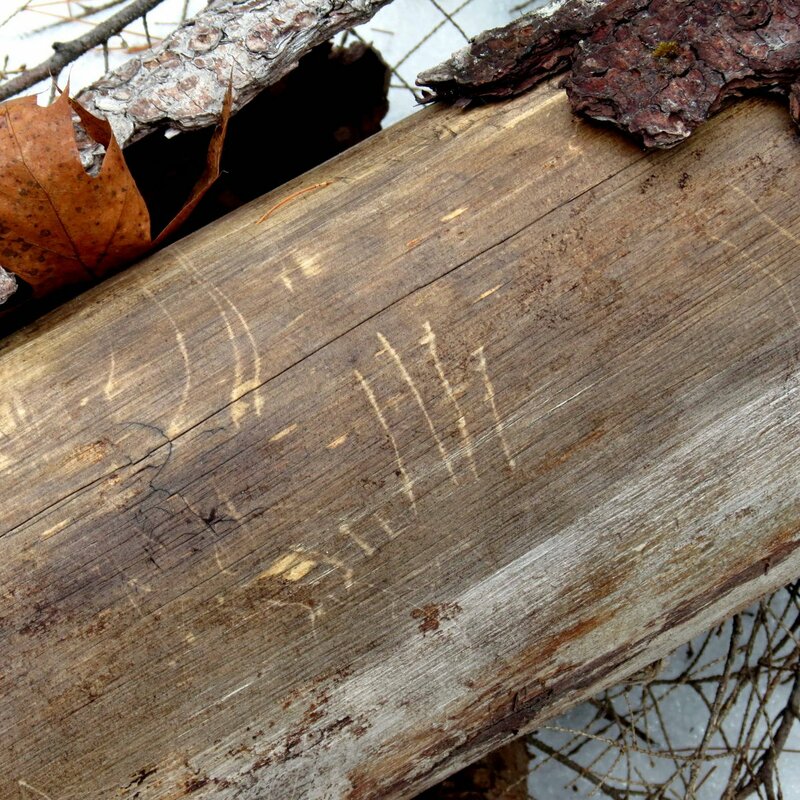 Another log had claw marks on it. 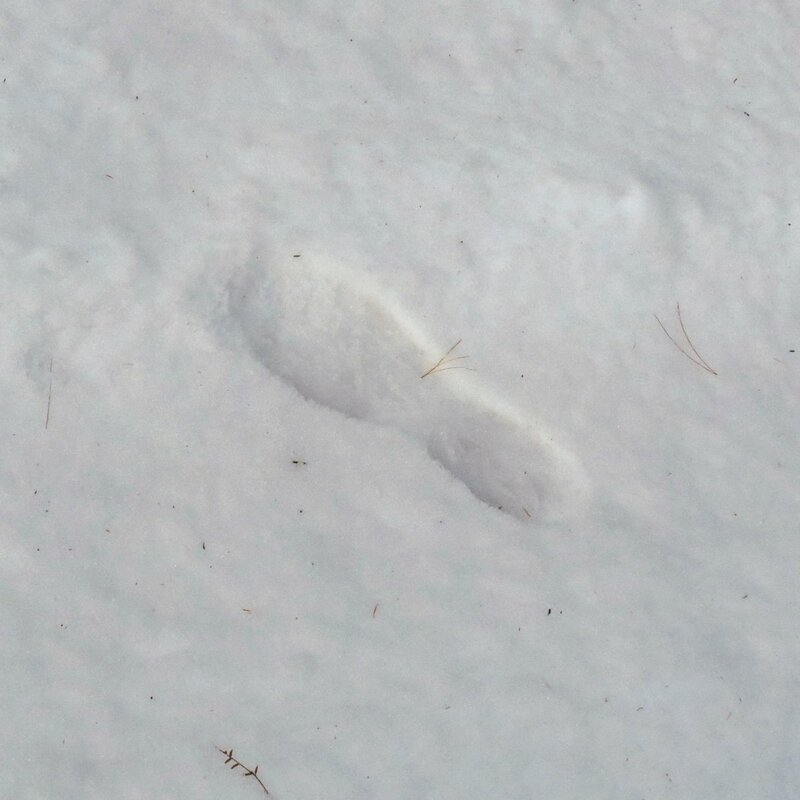 They puzzled me because the snow was ice covered and too hard for an animal to have left prints. 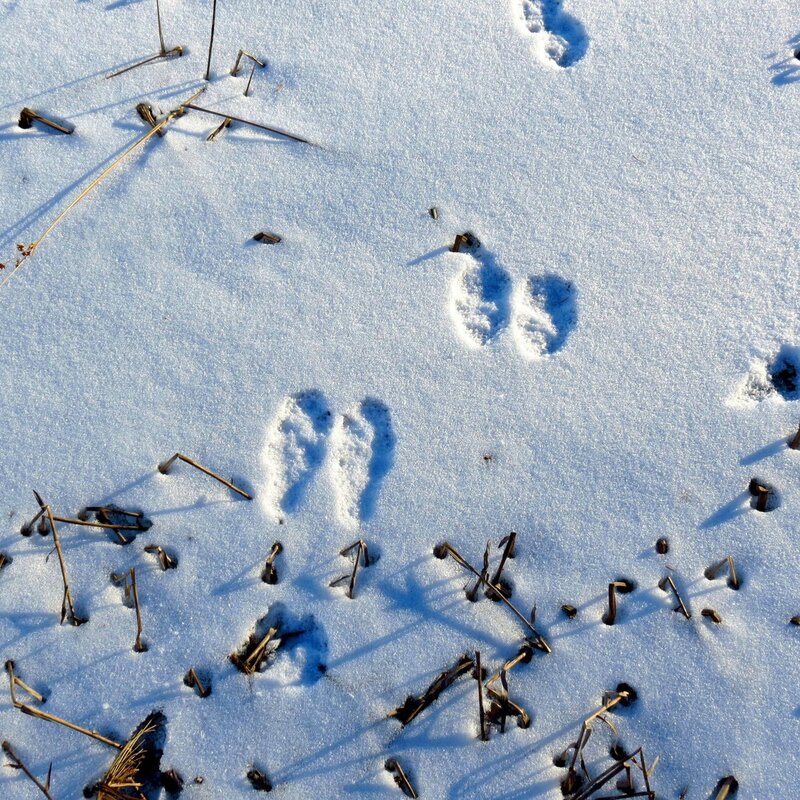 I’m guessing raccoon or maybe a bobcat; they were quite small, but bigger than a housecat would have left. Clubmosses held their heads up above the snow. This one looked like Lycopodium obscurum, commonly called ground pine, even though it has nothing to do with pines. 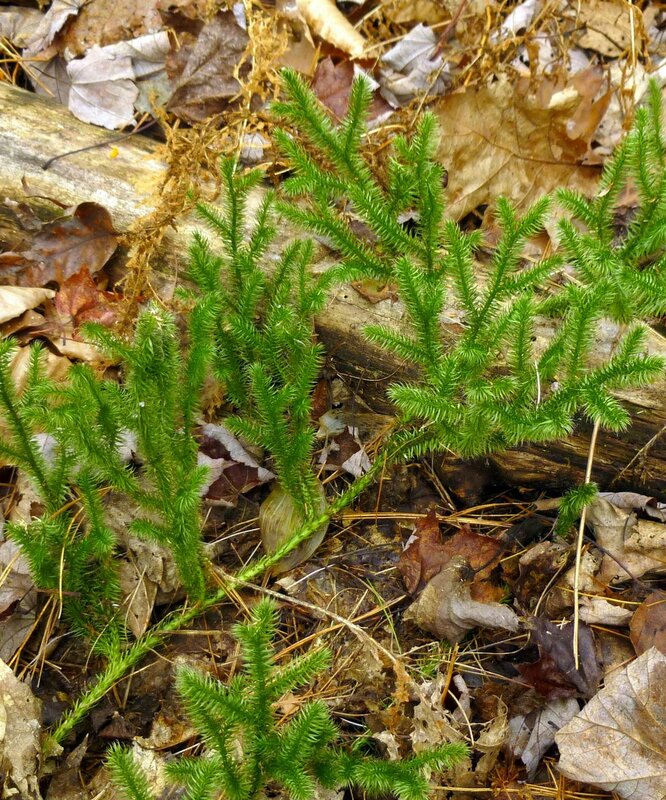 It is also called rare clubmoss though I don’t know why, because it is everywhere. The evergreen ferns are showing great fortitude this year. 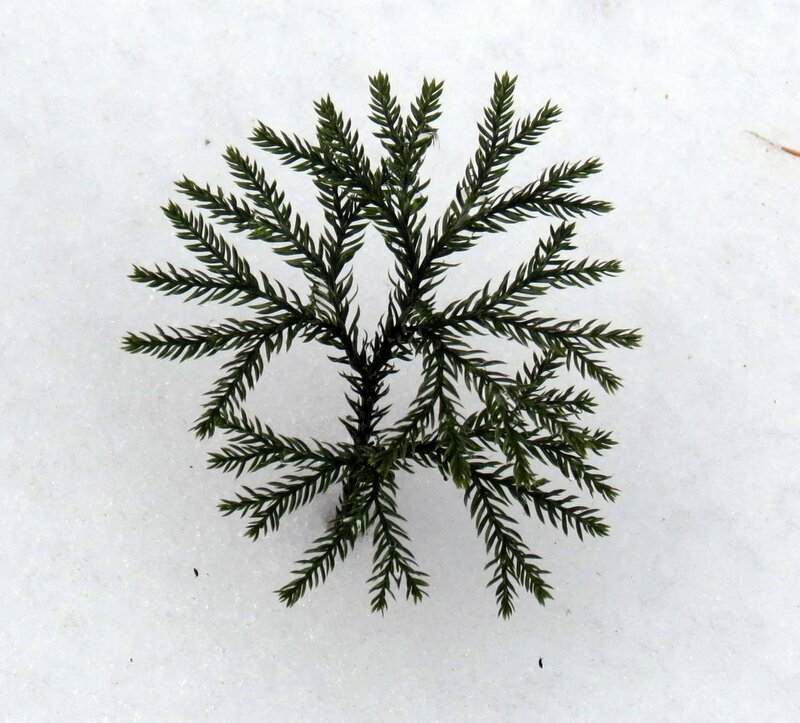 When I see one this way it looks so delicate but the snow and ice surrounding it tell a story of unsuspected toughness. 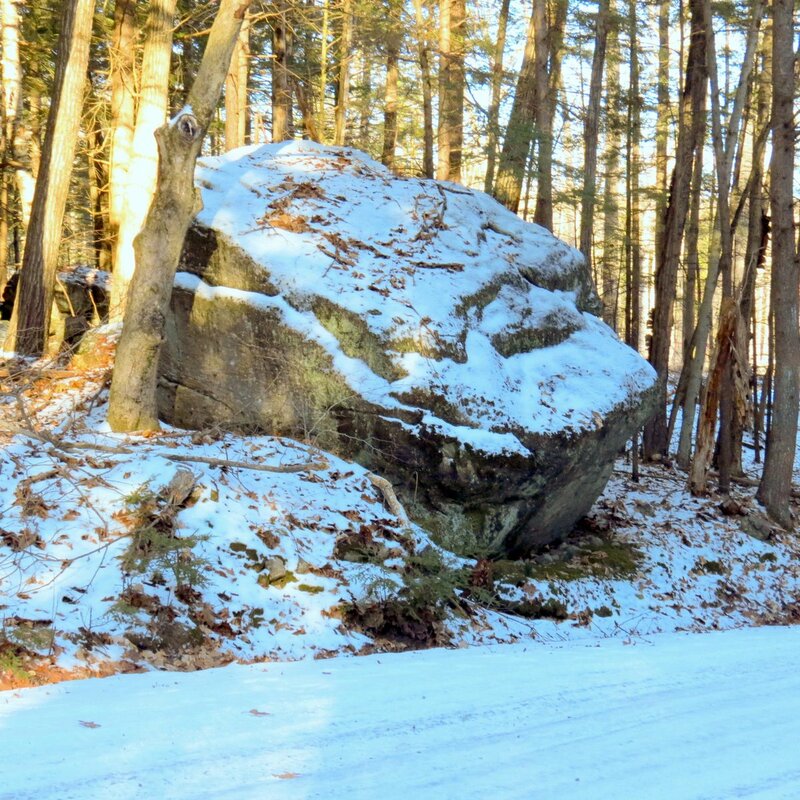 They’re very beautiful against the white snow and add so much to the winter landscape. I’m glad they’re so tough. 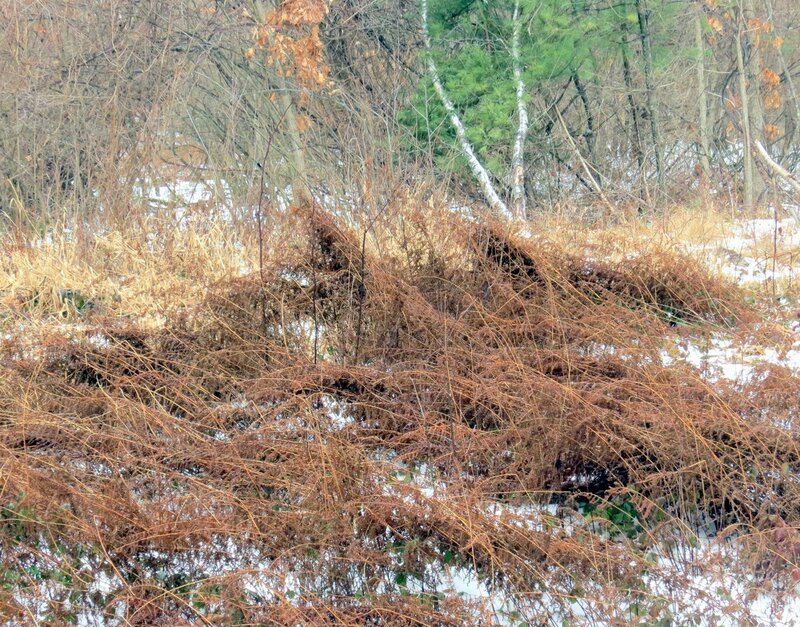 Even dead ferns add interest to the winter landscape. I like seeing their deep reddish brown color against the lighter tans of the grasses. It’s a simple thing that brings joy and puts a spring in my step. 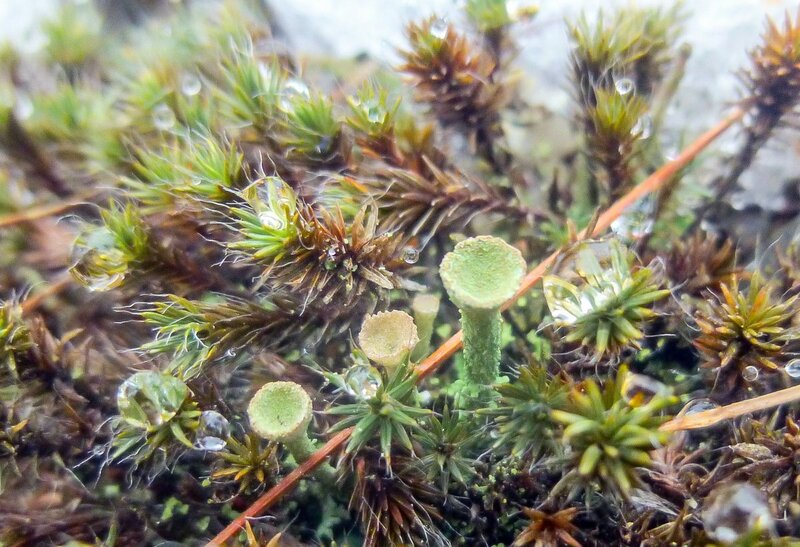 Pixie cup lichens (Cladonia asahinae) poked up out of the hair cap moss like tiny golf tees. I was hoping they would be fruiting so I could show you how they reproduce, but not yet. 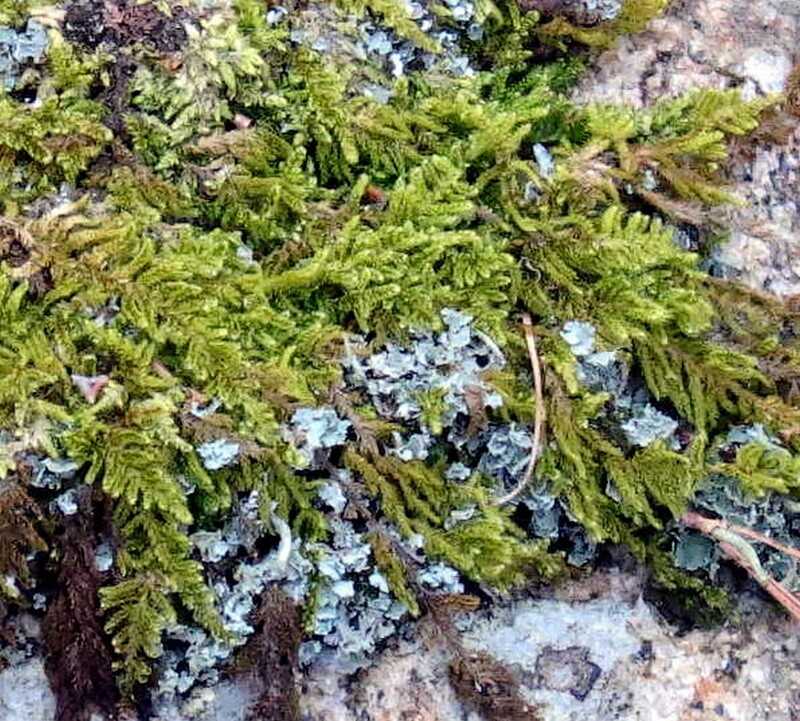 They, like many lichens, produce spores in the winter but it must happen later on. I’m not very good at keeping track of such things. 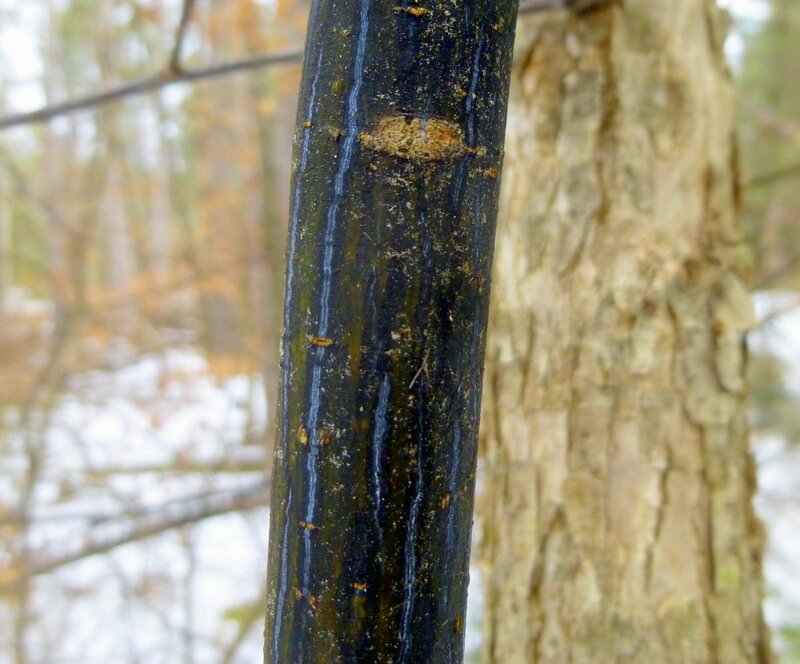 Striped maple (Acer pensylvanicum) has striped bark but I’ve never seen it come with blue stripes and I can’t find any reference to blue stripes on line. They are usually a cream / white color but will eventually disappear as the tree ages. I took this photo to show how dark the reddish brown bark of striped maple is when compared with other trees, such as the one on the right. This maple often grows in the form of a shrub here and might reach 15 feet tall on a good day. Another name for it is whistle wood because whistles are easily carved from the wood of its branches. 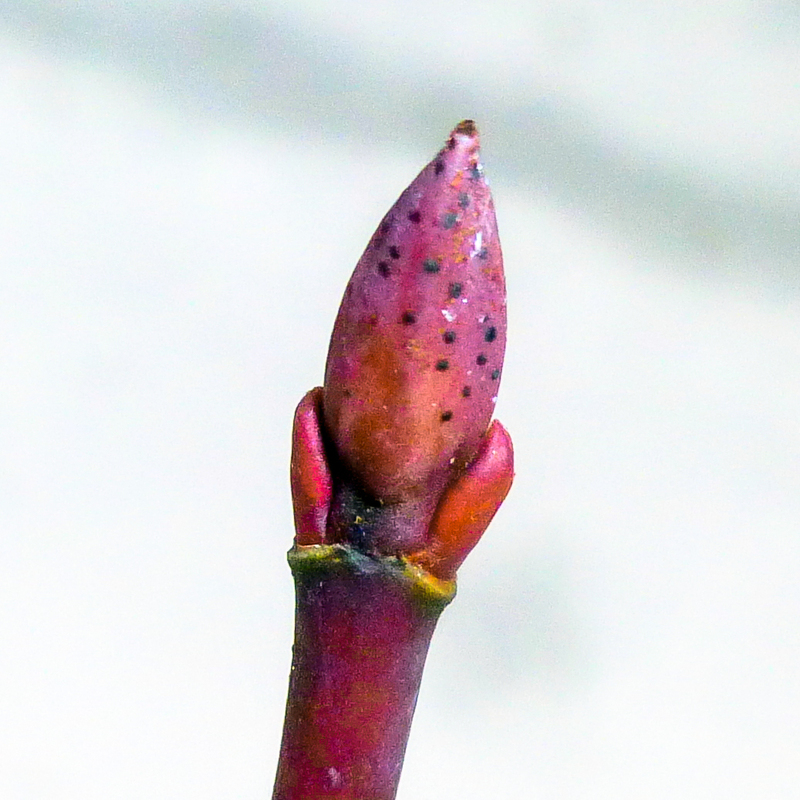 I knew that the buds and young twigs of striped maple were often tomato red but I’ve never seen spots on a bud before. This isn’t a very sharp photo but at least you can see the spots. It looked like someone had embroidered this brocade moss (Hypnum imponens) on the log it grew on, and that’s how it comes by its common name. 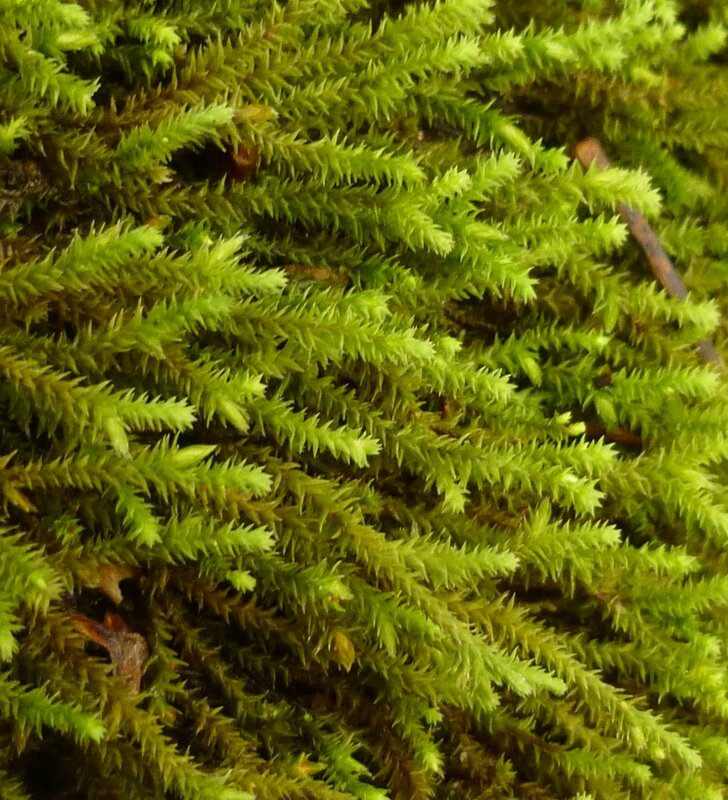 It’s a shiny, feathery moss that forms large mats, usually on wood but sometimes on soil. I’m not sure what the small blue bits are. 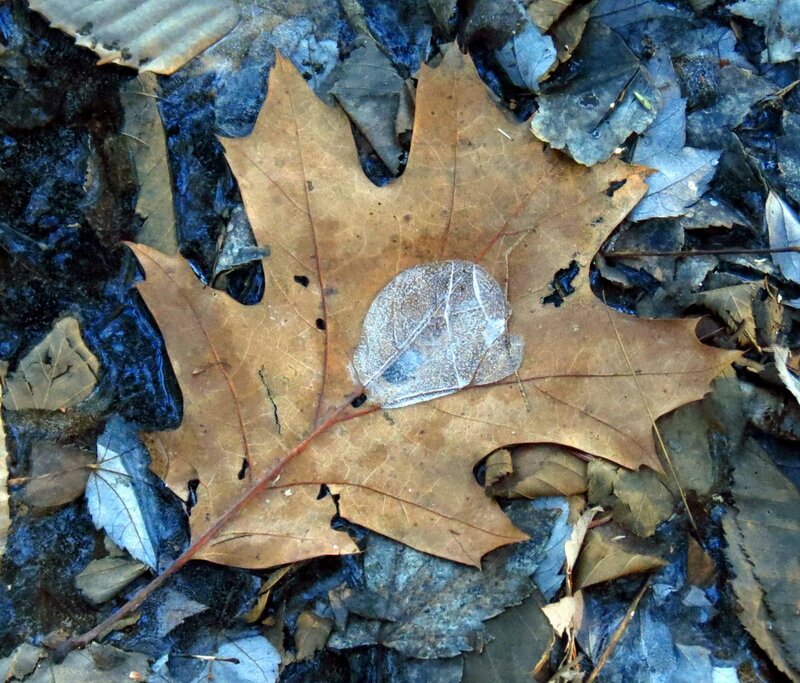 It must have been ice reflecting the blue of the sky. I didn’t see them in person so I’m surprised that the camera did. 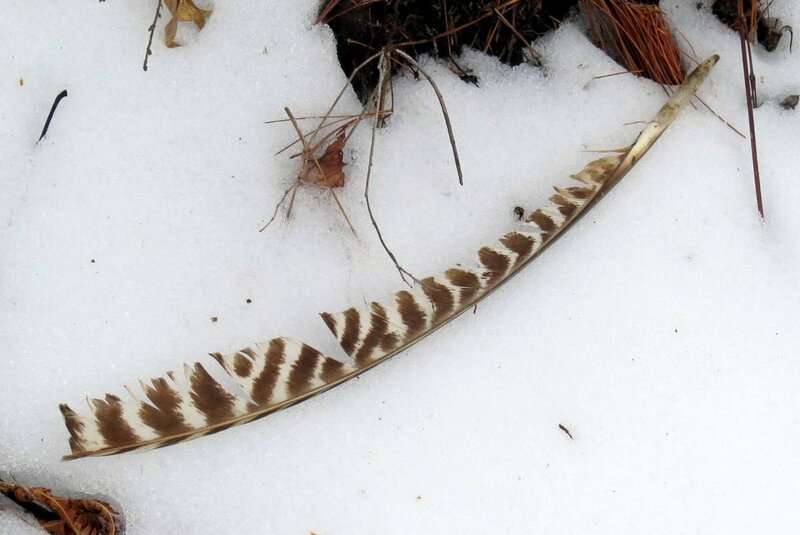 I was expecting to see some turkey tail fungi (Trametes versicolor) but this turkey feather was a surprise. There is a story behind it, but it’s one I’ll never know. 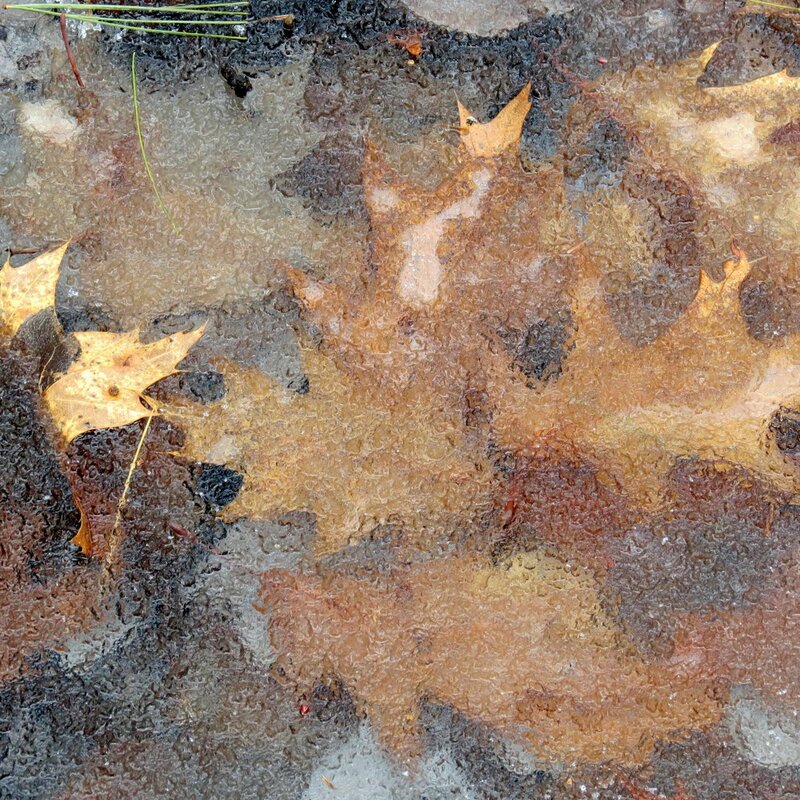 I was also hoping to see some crystal clear ice but it had been snowed on and re-froze with a textured surface more like pebbled glass than crystal, but I could still make out the shapes and colors of the oak leaves under it. 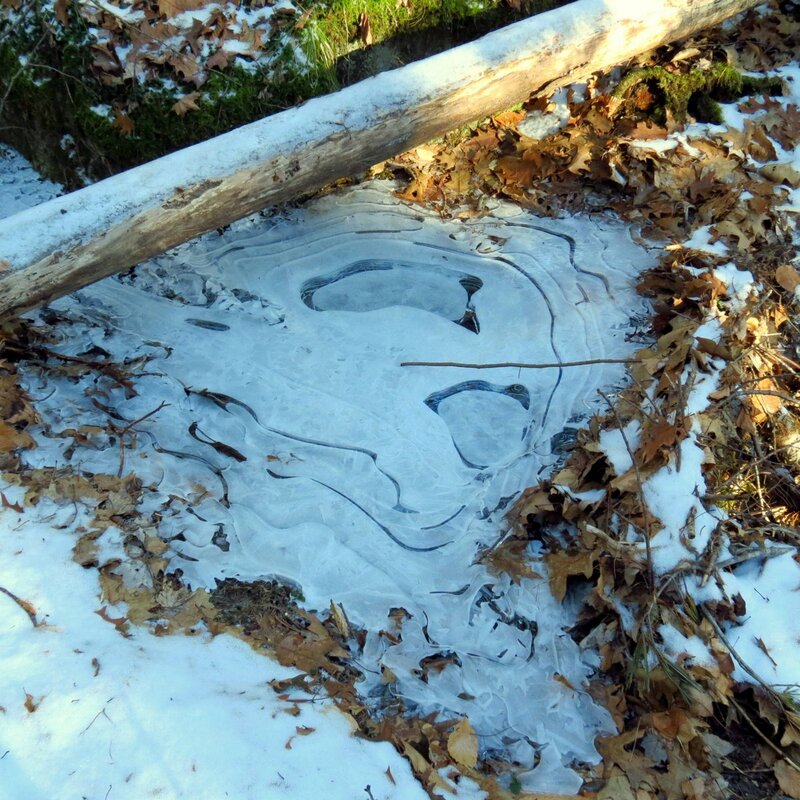 The ice on the stream that used to feed the beaver pond was paper thin and wind sculpted. The animals are still having an easy of time finding water but are probably having a hard time getting around on the icy, crusted snow. 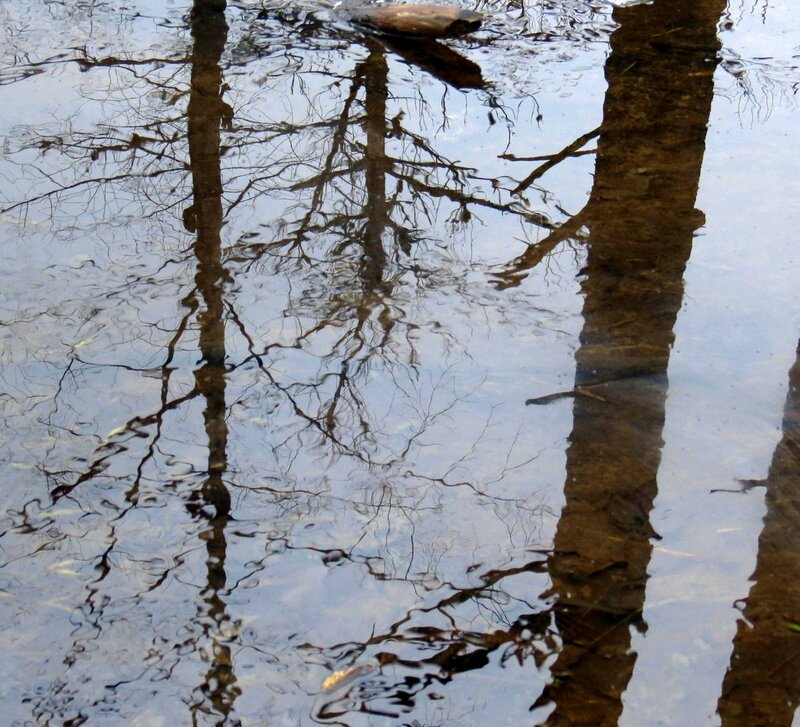 A few woodland pools were ice free. 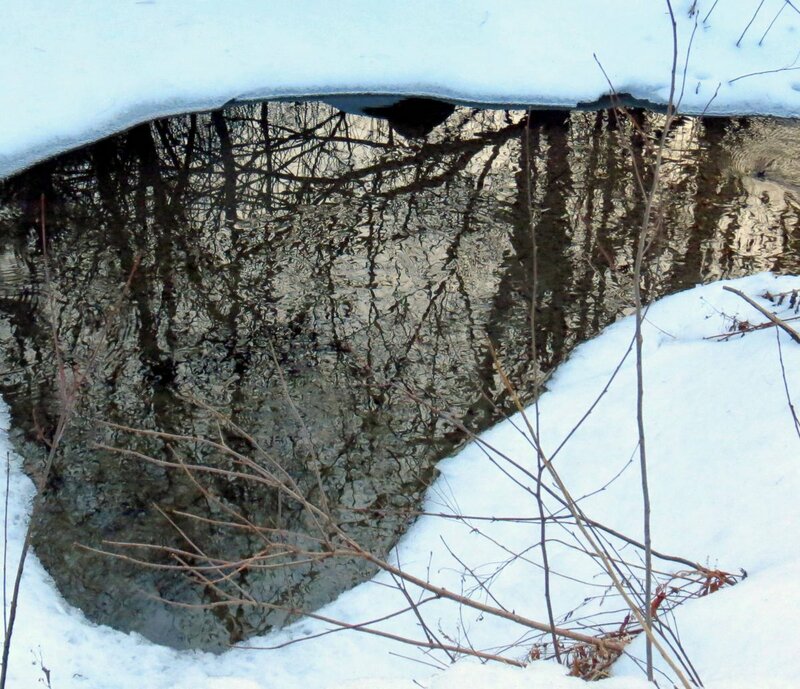 They reminded me of the forest walks I’ve taken on moonlit nights when the moonlight shimmers and swims in the dark water of pools like this one. It’s something I haven’t seen in a long time but I’ve had an itch to try night time photography, so it might happen when the moon is full enough to light the way. I haven’t said much about mosses lately but since now is the time they are most easily seen I thought I’d get out there and see what I could find. Rose moss (Rhodobryum roseum) is one of the most beautiful mosses in my opinion, and gets its common name from the way that each plant looks like a tiny rose blossom. Rose moss is also a good indicator of your surroundings because it prefers growing in lime rich soil or on limestone boulders. 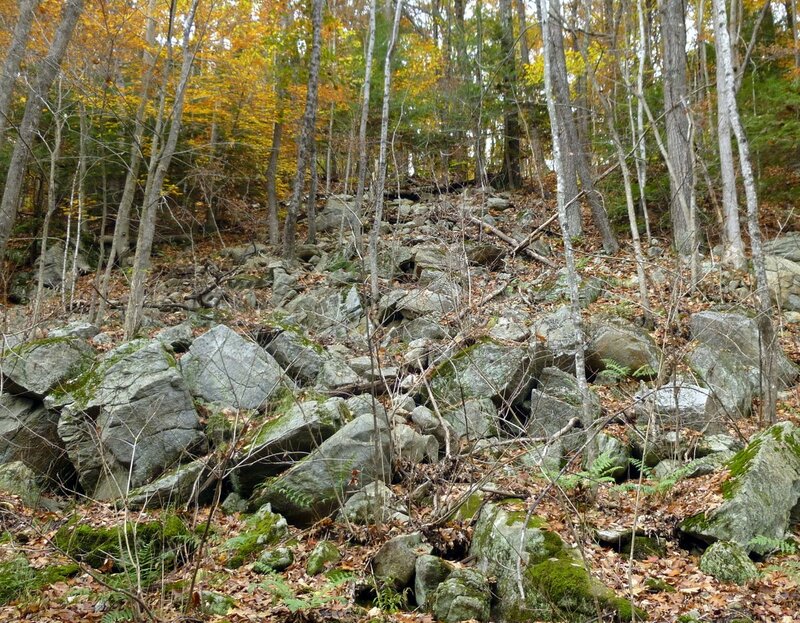 Can you tell which of these boulders have limestone in them? I can’t either but rose moss can, and it grows on just two of them. 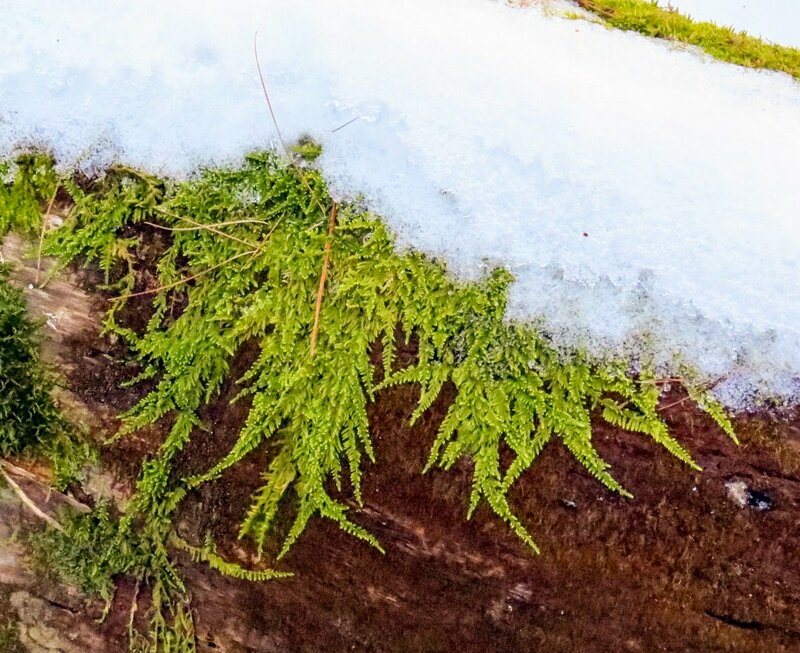 Stair-step moss (Hylocomium splendens) is another very pretty moss that looks quite fragile, but I’ve seen it with icicles hanging from it and I can say with certainty that it’s a lot tougher than it looks. That is most likely why it grows as far north as the arctic tundra. When dry this moss has a slight satiny sheen to it, and that’s probably how it came by its other common name of glittering wood-moss. Stair step moss gets its name from the way the new growth “steps up” off the midrib of the previous year’s branch. Each year a new branch grows from the old and this growth habit allows stair step moss to grow up and over other mosses. You can tell the age of the moss by counting these steps. What I think is yellow feather moss (Homalothecium lutescens) always looks pale and kind of sickly, but if you look closely at its growing tips and new spore capsules you’ll find that it quite healthy. If you see it at all, that is; I know of only one small colony that grows on the very end of a log with a diameter of an average doughnut, and I’ve never found it anywhere else. It’s easy to see how white tipped moss (Hedwigia ciliata) got its common name. 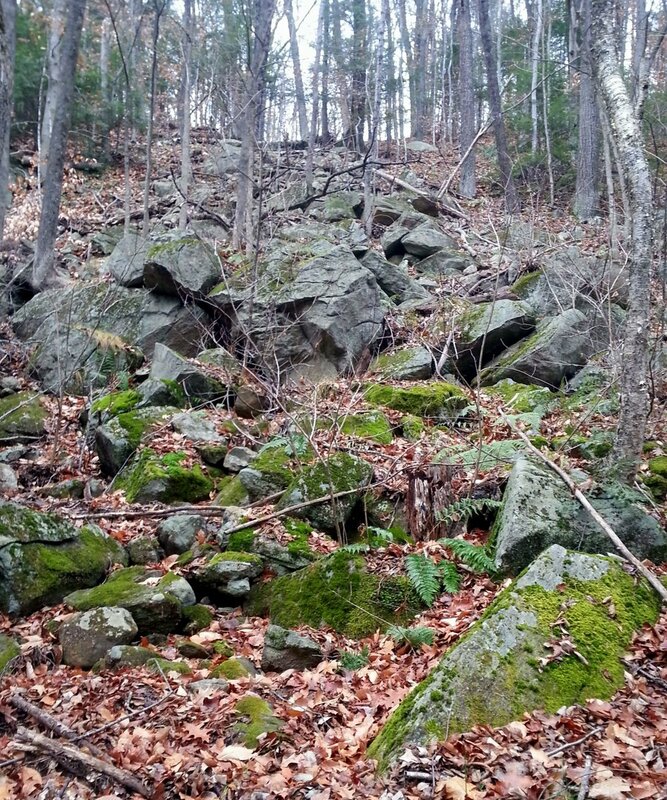 This is a fairly common moss that seems to like to hang from the sides of boulders and ledges. Another name for it is Medusa moss, because when dry its leaves press close to the stem and it takes on a very wiry, string like appearance. Its ball shaped orange spore capsules (sporophytes) are hidden among the leaves on very short stalks, so they’re hard to see. 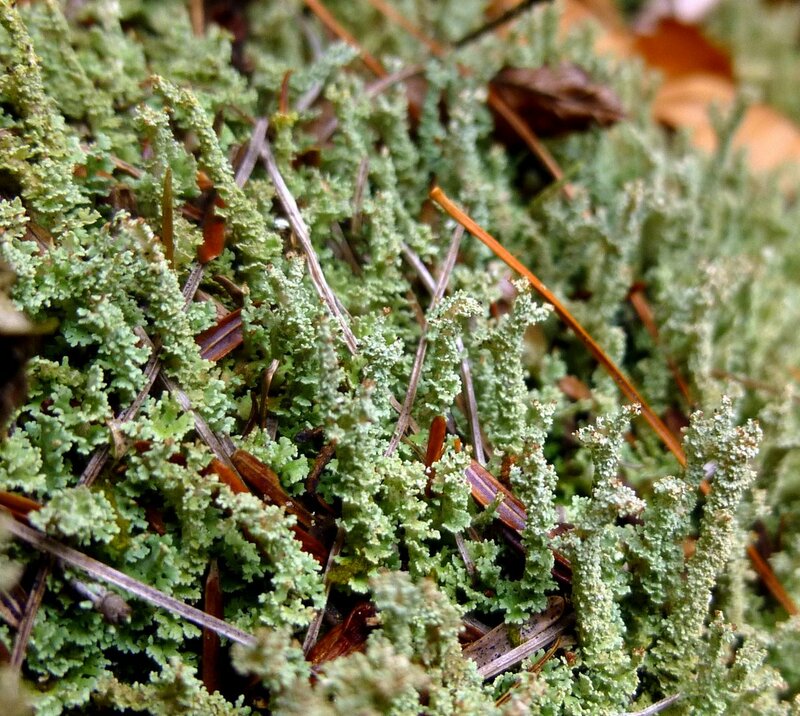 This moss will even grow on asphalt roofs, so it is a perfect choice for green roof projects. Delicate fern moss (Thuidium delicatulum) is another pretty moss but I’m not sure how it comes by its common name because it is far from delicate. I have a few patches of it growing in my back lawn that get mowed and walked on regularly and they thrive in spite of the abuse. 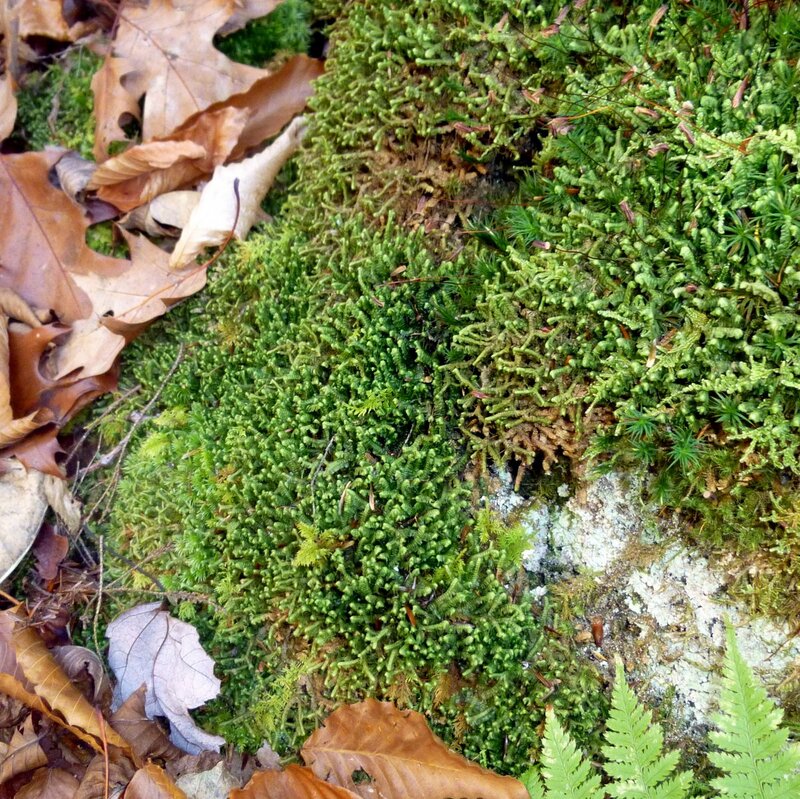 The leaves of this moss grow more horizontally than vertically and it often forms very low, dense mats on logs or the forest floor in damp, shaded places. Some “mosses” might have to be looked at a little closer.The growth on this stone isn’t a moss at all, though from a distance it looks just like one. 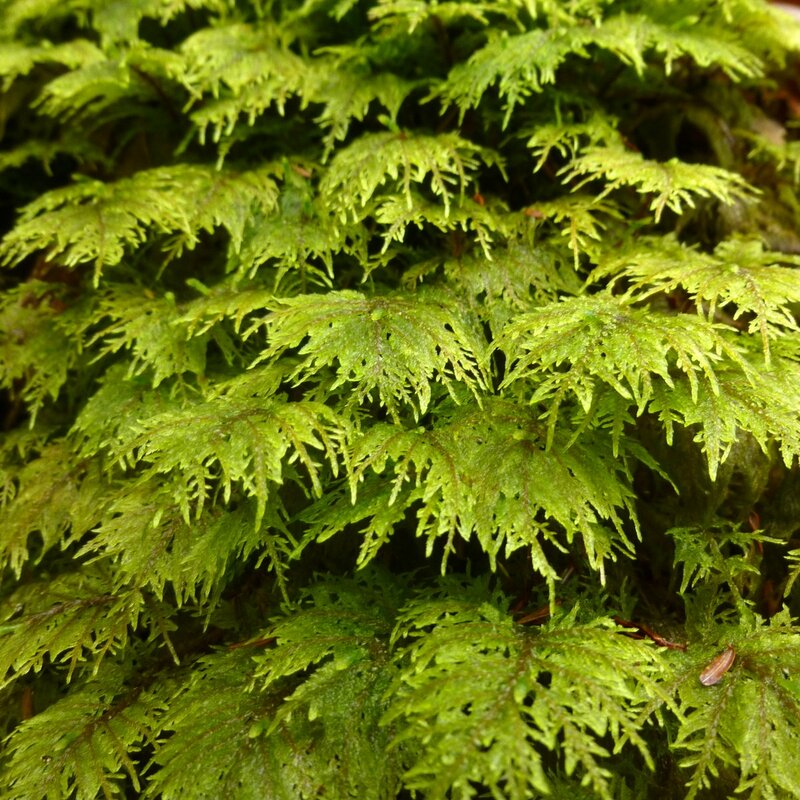 It’s actually a liverwort called greater whipwort (Bazzania trilobata) and it grows right alongside mosses. Something else often found growing on boulders right beside mosses is rockfoam lichen (Stereocaulon saxatile.) 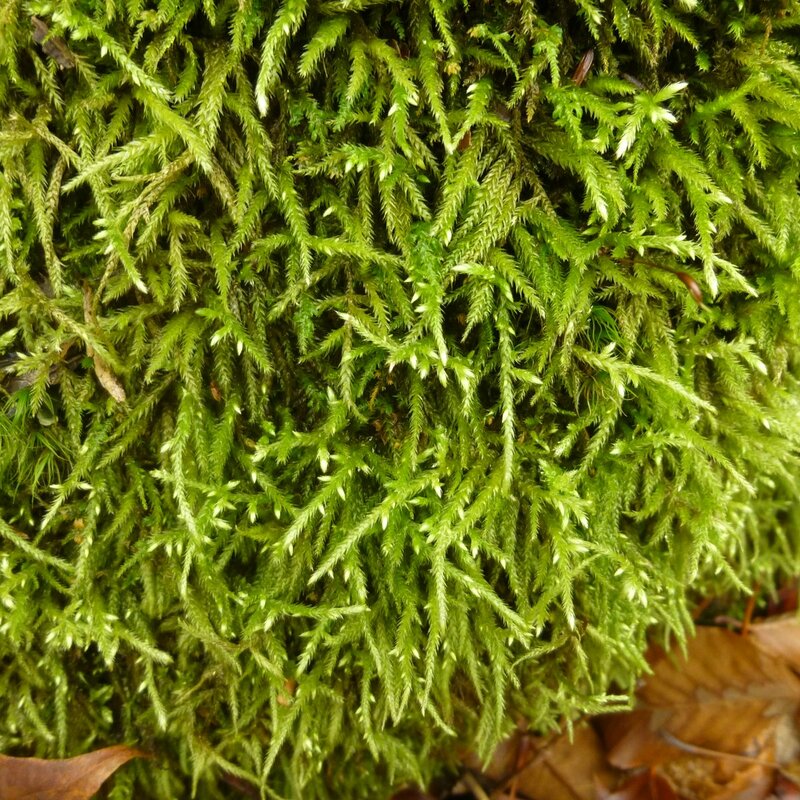 Mosses soak up moisture like a sponge when it rains and then release it slowly and lichens often take advantage of this. The best time to search for both lichens and mosses is after a rain because both are at their best when wet. Haircap moss (Polytrichum commune) gets its name from the hairy covering (calyptra) on its spore capsules (sporophytes). 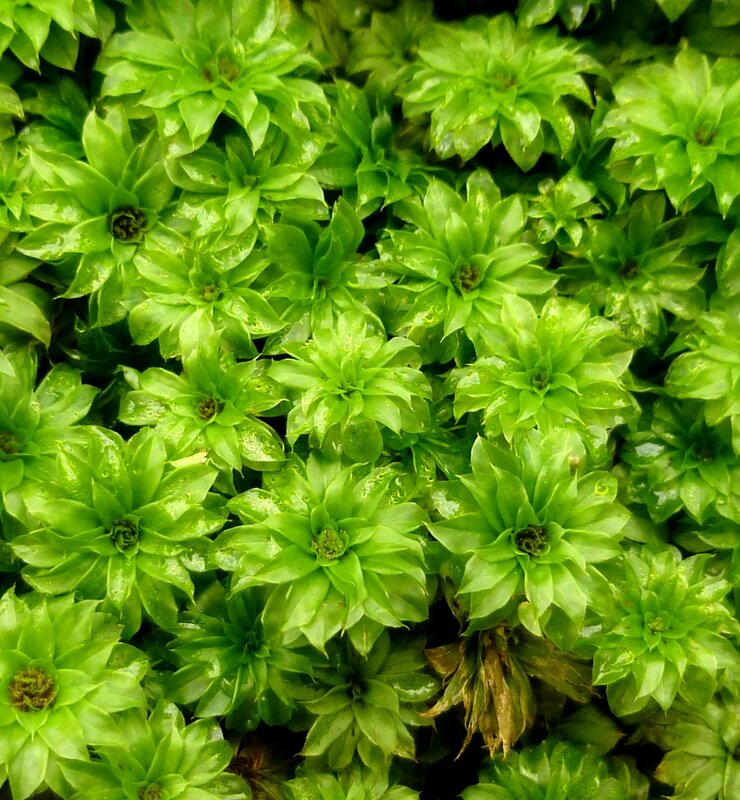 It is a very common moss that grows in dense colonies of 2-4 inches tall, often mounded in the center. 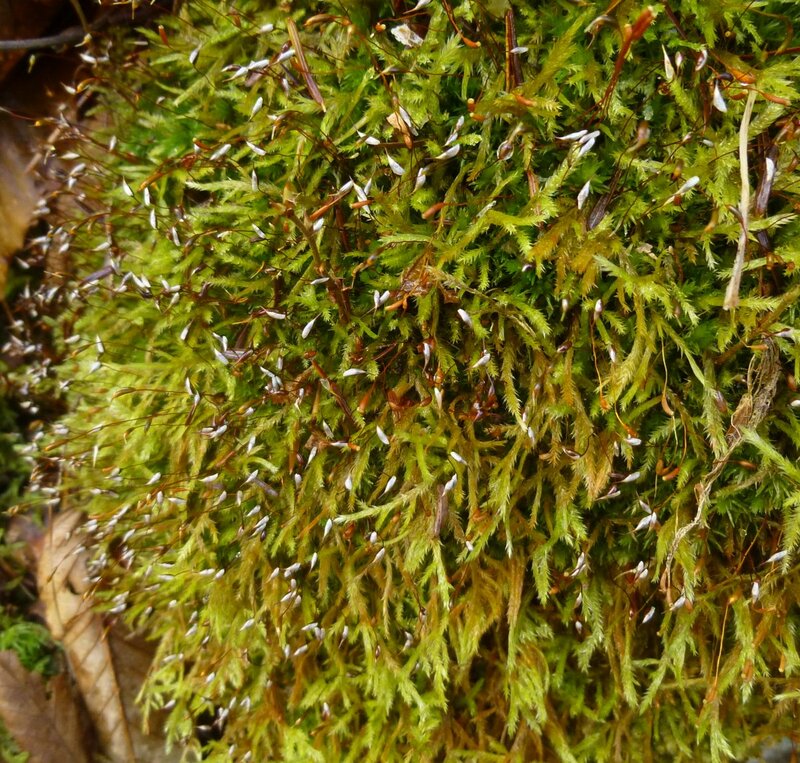 The sheaths on its leaves can be golden yellow and shiny and give this moss another common name of goldilocks. I see it almost everywhere I go. Haircap moss spore capsules start life round bat as they age become almost square and winged. The example in this photo still has its end cap or lid, called an Operculum, in place. This means that it hasn’t released its spores yet. I’m not sure what caused the blue color but this is the only blue spore capsule that I’ve seen. 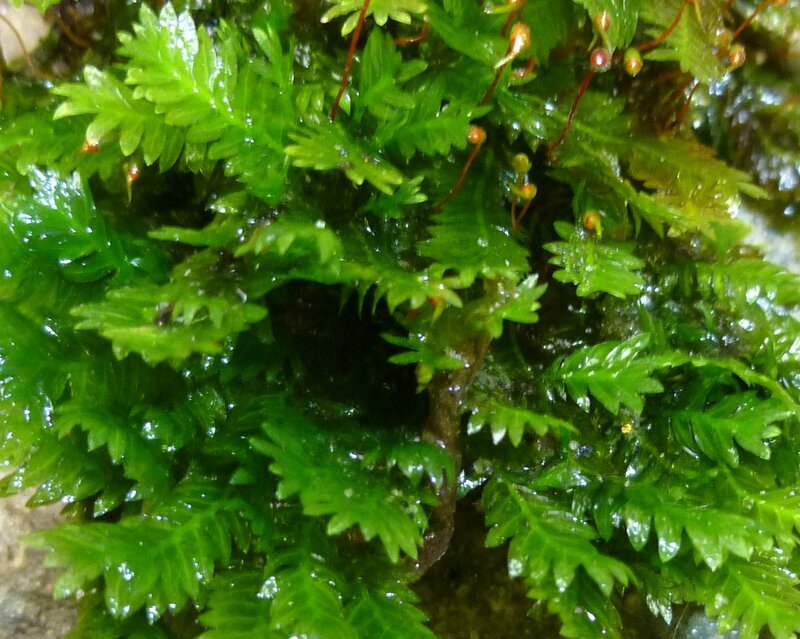 One reason I don’t do more posts on mosses even though they fascinate me is because they can be difficult to identify without a microscope and many of them look very similar. A good example of that is what I think is this narrow leaved beard moss (Helodium paludosum.) It looks a lot like the Hedwigia ciliata we looked at earlier, but without the white tips. The reason I wanted to show this moss is because of the immature spore capsules (sporophytes). When young the sporophyte is completely surrounded by a tough protective covering called the calyptra. 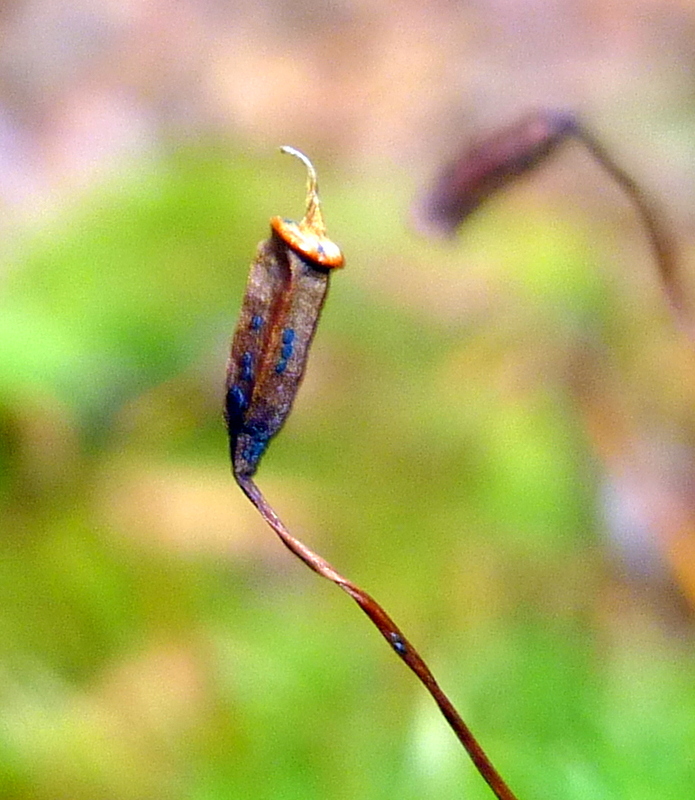 The calyptra is what gives the spore capsules in the above photo their whitish color. 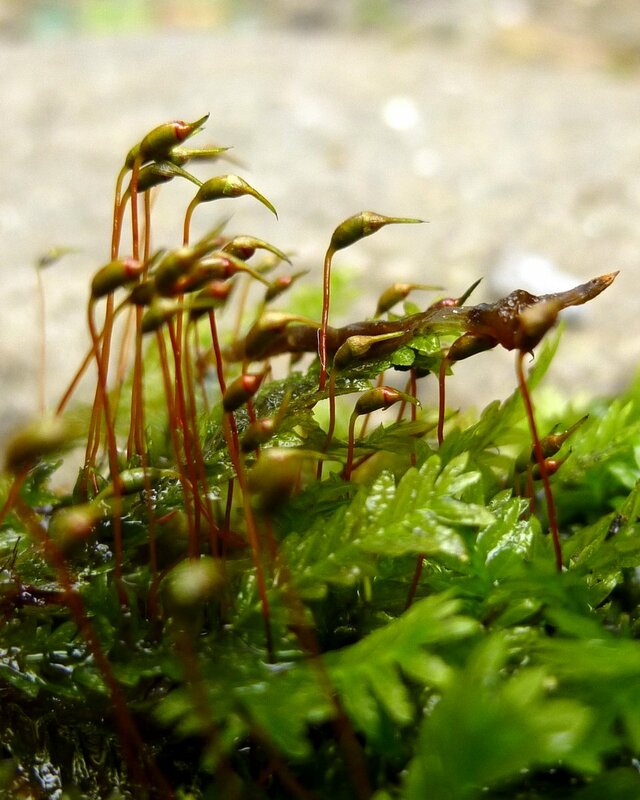 As the sporophytes grow their skin-like calyptras will be shed, revealing their reddish brown color. So, if you find a moss with white spore capsules you know that you are actually seeing its immature capsules. Brocade Moss (Hypnum imponens) is very shiny and sometimes has an orange brown color. Its common name comes from the way it looks as if it has been embroidered on whatever it happens to be growing on. It is easily confused with knight’s plume moss (Ptilium crista-castrensis,) but the spore capsules on knights plume moss are elbow macaroni shaped and horizontal, while those of brocade moss are cylindrical and stand vertically, as seen in the above photo. Mosses often change color when it gets colder and this delicate fern moss surprised me with what I thought was its bright orange color. My color finding software told me it was just my color blindness again, because it is really lime green. It is a very bright lime green though, and was shining like a beacon. I hope I didn’t bore all of you to tears talking about mosses. 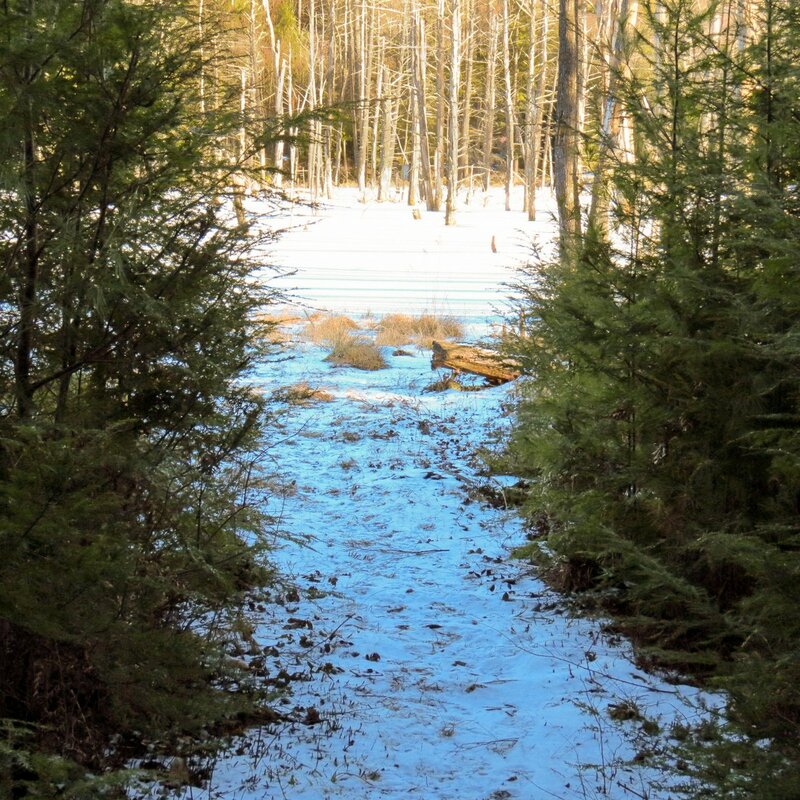 Soon there will be very little besides moss that is still green, and for me there are few things more pleasurable than walking through the snowy winter woods with a bright blue sky overhead and the sunshine falling on some of the only green things to be seen. 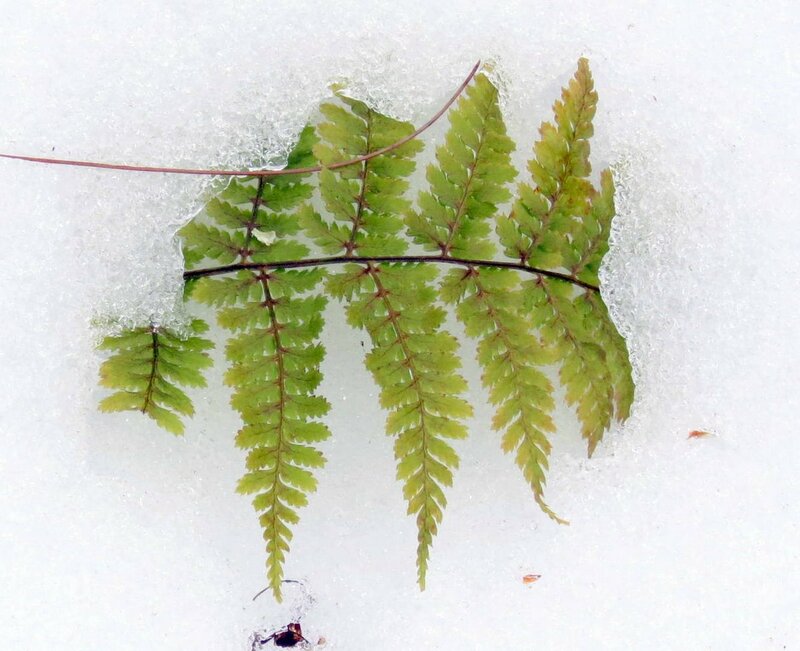 Mosses, lichens, liverworts, and a few evergreen ferns are part of what make nature study fun even in winter. After over a year of using my moss identification guides to identify various mosses, I think I’m ready to do at least one post on them. I’m fairly confident that the following plants are what I think they are, but I don’t have access to a microscope so none of this information should be taken as absolute gospel. Information about the guides I’ve used can be found under the “Books I Use” tab at the top of the page. My thoughts usually turn to mosses and other forest floor dwellers at this time of year because they’re so easy to see with no leaves in the way. 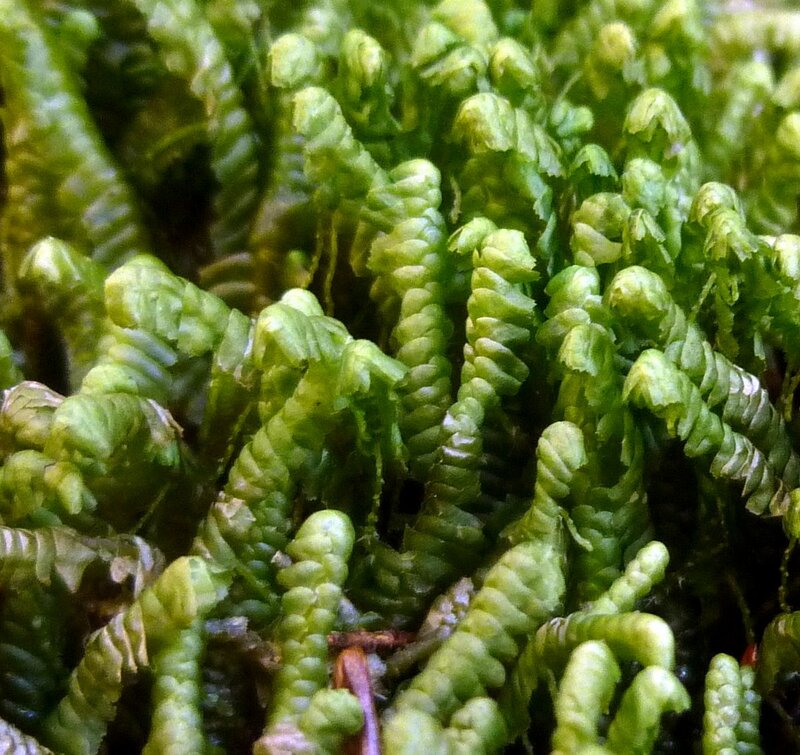 Instead of roots mosses have small, thread like rhizoids. Since they can’t take up water like vascular plants they absorb it like a sponge over their entire surface, and when they’re seen in abundance as in the above photo, it’s a fair bet that the soil is either quite moist or the area is shaded enough to keep them from drying out between rains. 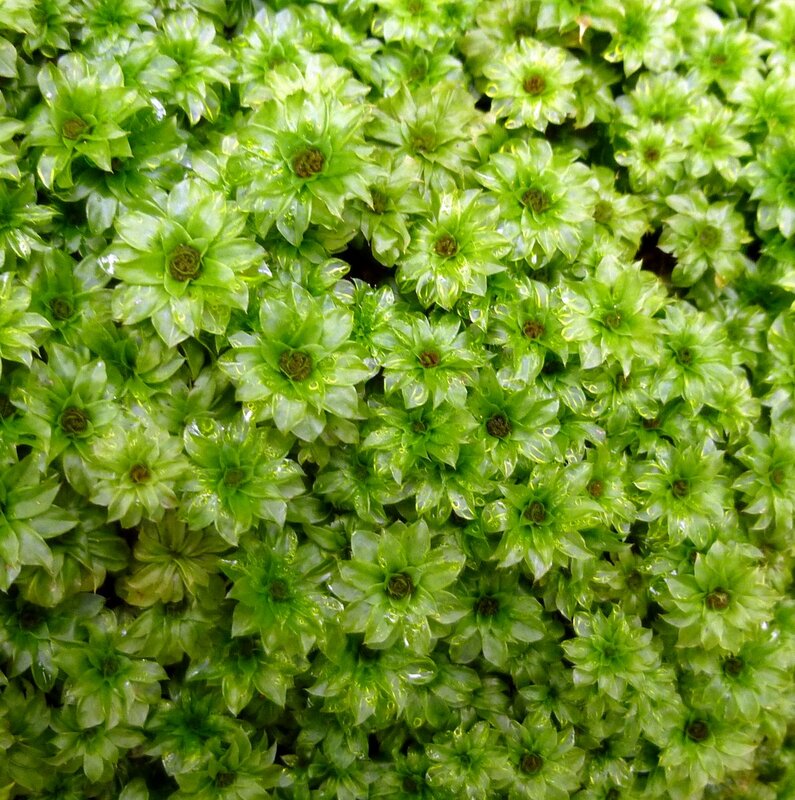 Though some mosses can go for quite a while with no water, most need regular replenishment. Like lichens, mosses can look very different when they are dry, so serious moss hunters like to do their hunting after a rain. Since I’ve never paid very close attention to mosses I never realized that some of them, like rose moss, had leaves that are quite big-easily big enough to be seen with the naked eye-and can be quite beautiful. Rose moss (Rhodobryum roseum) gets its common name from the way its rosettes of leaves look like tiny flowers. When rose moss dries out its leaves contort and fold upward like petals of flowers that close at night. I found a large colony of this moss growing on a boulder. 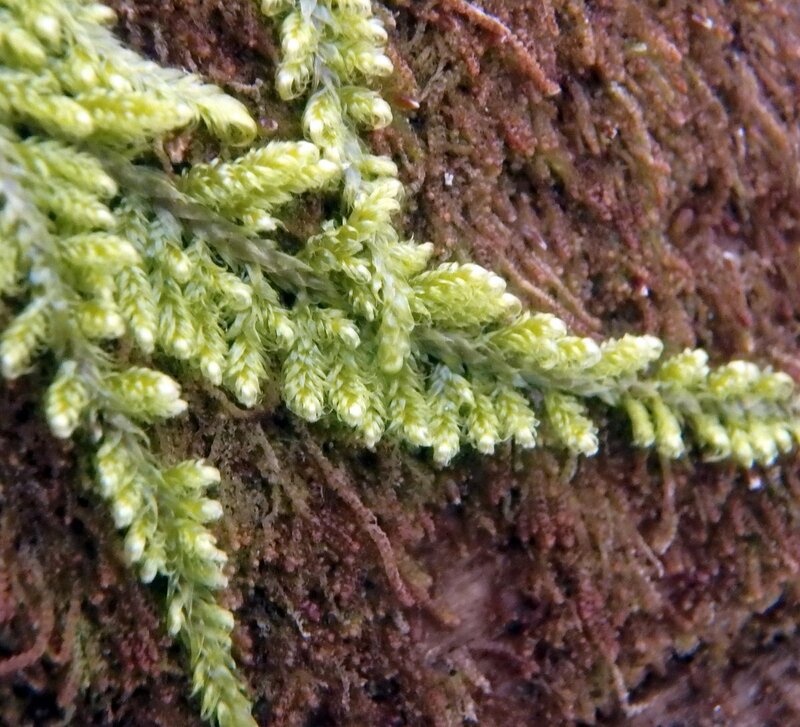 Pocket moss gets its common name from the way the lower lobe of its leaf curls around its stem to form a pocket. That feature can’t be seen in the photo and neither can the way the central nerve, or vein of each leaf stops before it reaches the leaf tip, but those two features plus the fact that the example in the photo was constantly dripped on by ground water tell me that this is maidenhair pocket moss (Fissidens adianthoides). The capsules where some mosses produce spores are called sporophytes. 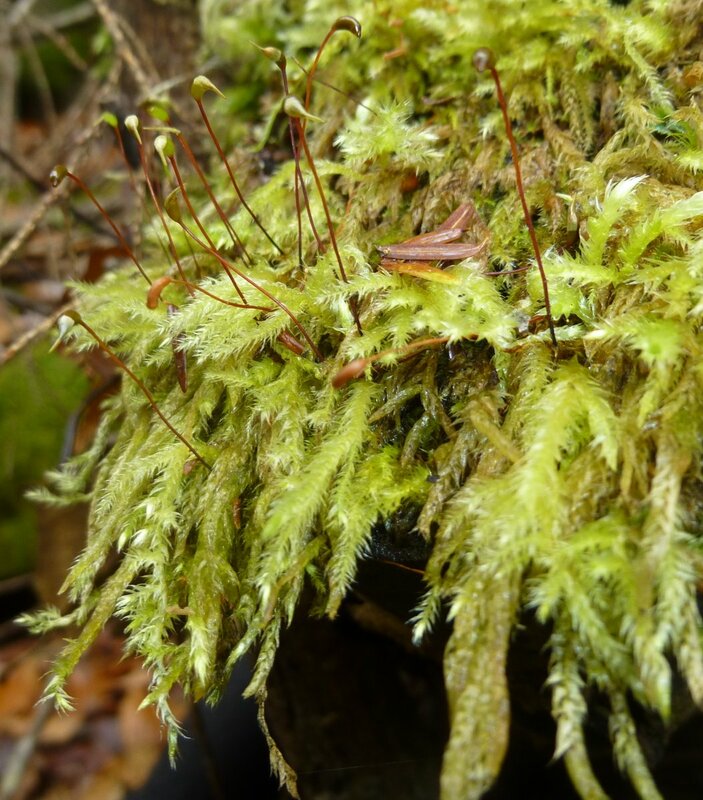 In the case of maiden hair pocket moss the capsules are like a tiny barrel that is covered on one end by a calyptra, which is a piece of tissue that looks like a stocking cap. When the spores mature the calyptra dries out and falls off, but before it does the fruiting bodies of this moss remind me of cranes. Or herons. 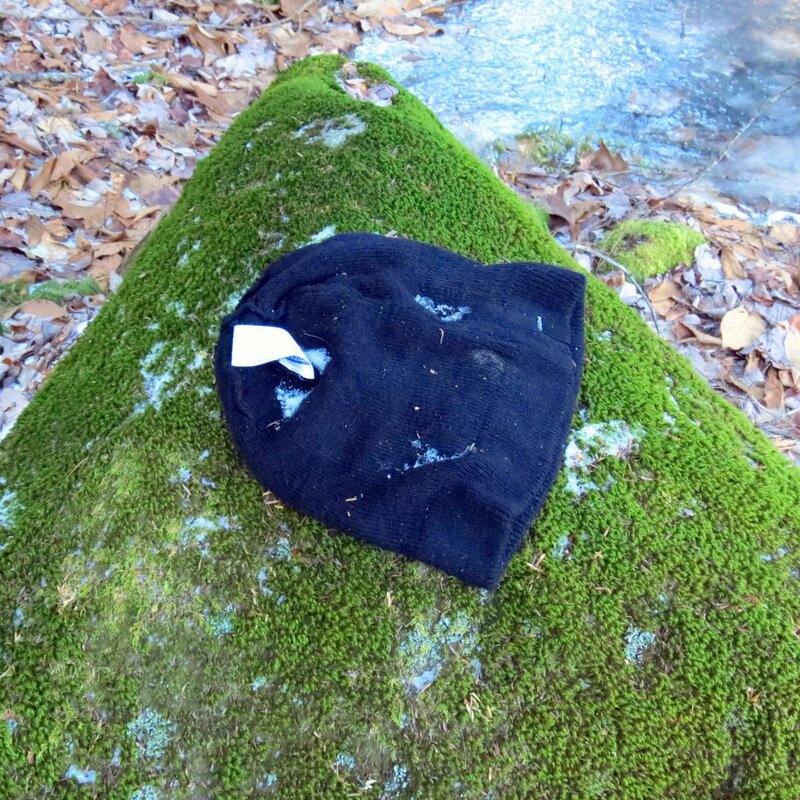 Under the tiny stocking cap is a lid (operculum) that also comes off so the spores can be released. This happens at different times of year for different mosses. The name medusa moss (Hedwigia ciliata) comes from the way this moss looks like a bunch of tangled worms when it dries out. This moss is fairly common but I don’t think I’ve ever seen it grow quite as long as it was here. It was obviously in a good location for optimum growth. This is a closer look at the Hedwigia ciliata in the previous photo. 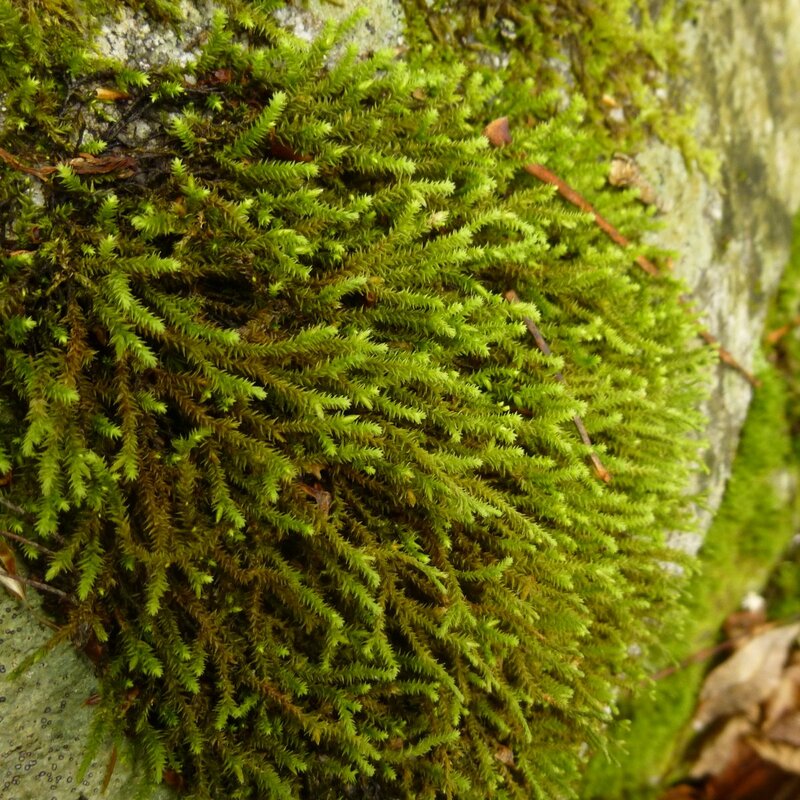 It is also called white tipped moss and is almost always found growing on large boulders in the woods. The last time I saw a dog lichen it was growing on a rotting stump but this one, Peltigera membranacea, was growing on a mossy boulder. 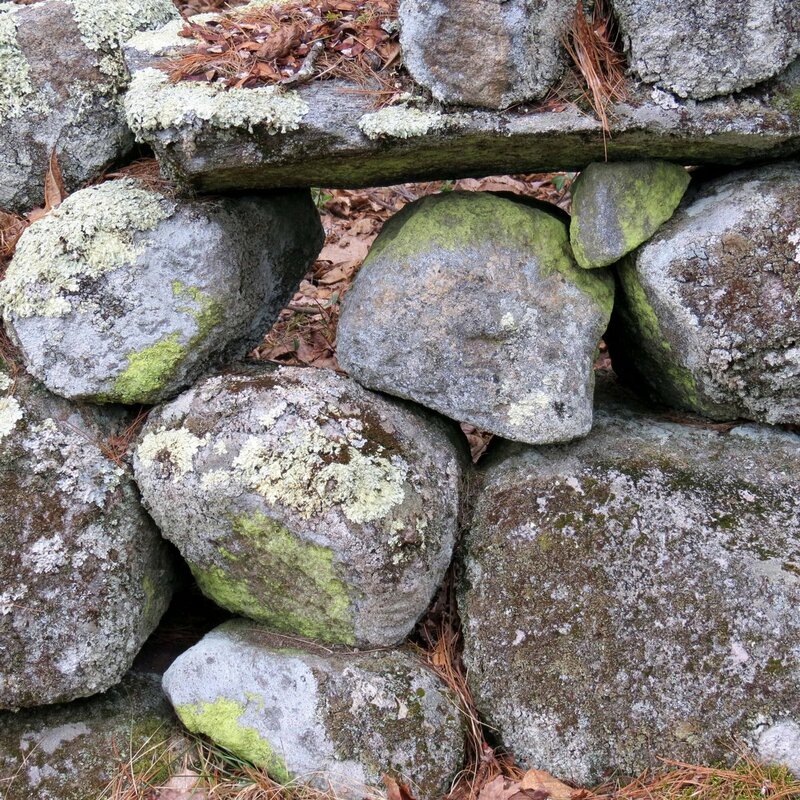 Dog lichens are associated with mossy area because the mosses provide the moisture that they need. This is known as a membranous lichen, which simply means that it is thin and pliable. It is also a foliose lichen, meaning that it is lobed, or leaf like. The upper part of the body (Thallus) is undulating or veined as seen in the photo. This lichen was large and easy to see. It was also probably quite old. 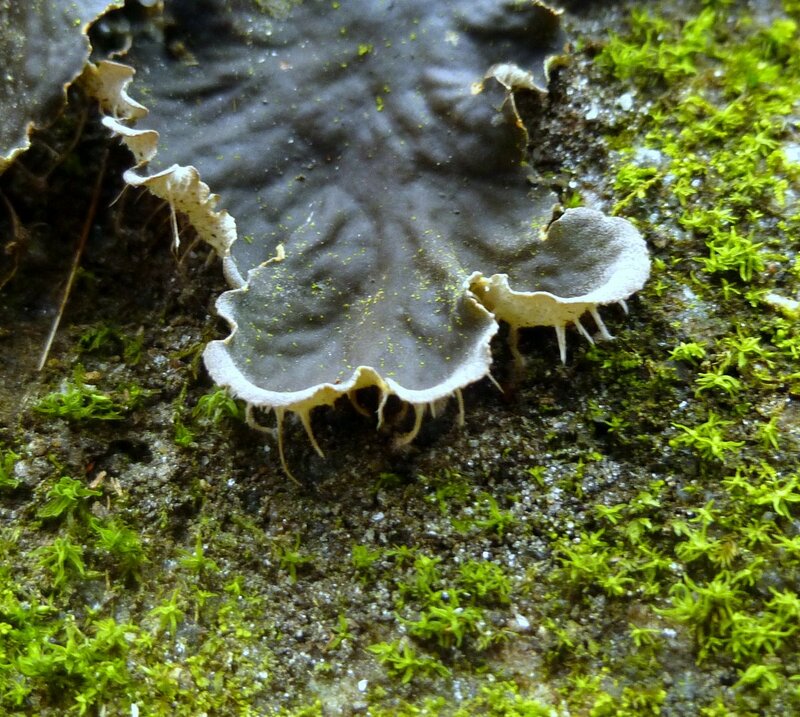 The white “roots” on the underside of the lichen body are called rhizines. 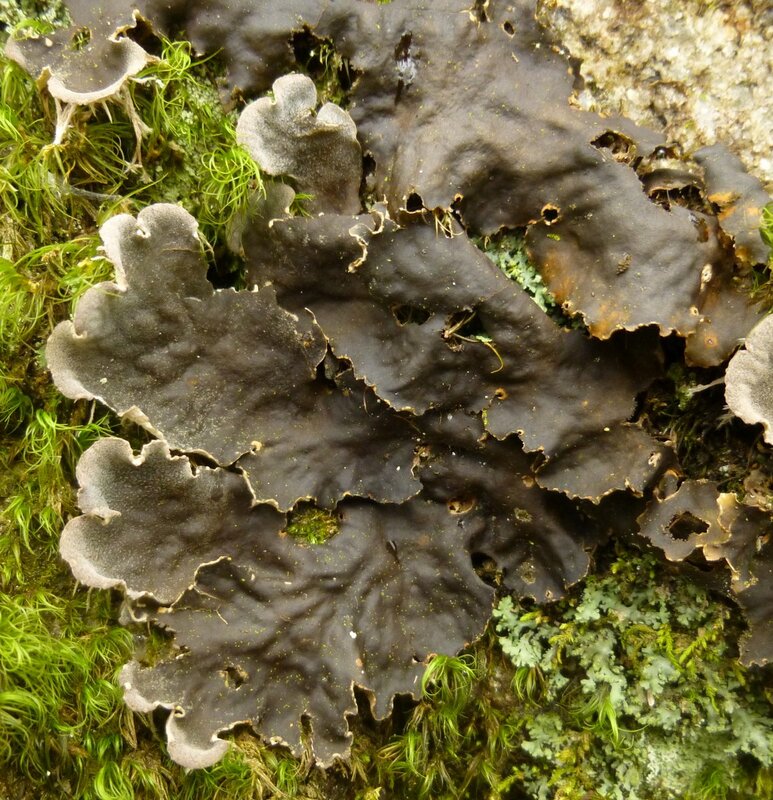 On some lichens these can be quite bushy but on Peltigera membranacea they are narrow, thin and “fang like”. They are one of the identifying characteristics of this lichen along with its thin, flexible, undulating thallus. I’ve heard another theory behind the name “dog lichen.” It says that the name refers to the large, lobed body of the lichen looking like dog ears. It sounds plausible, but so do the other three theories I’ve heard. One says the fang like rhizines look like dog’s teeth, another says the entire lichen body looks like a dog, and yet another says that the apothecia, or fruiting bodies, look like dog ears. 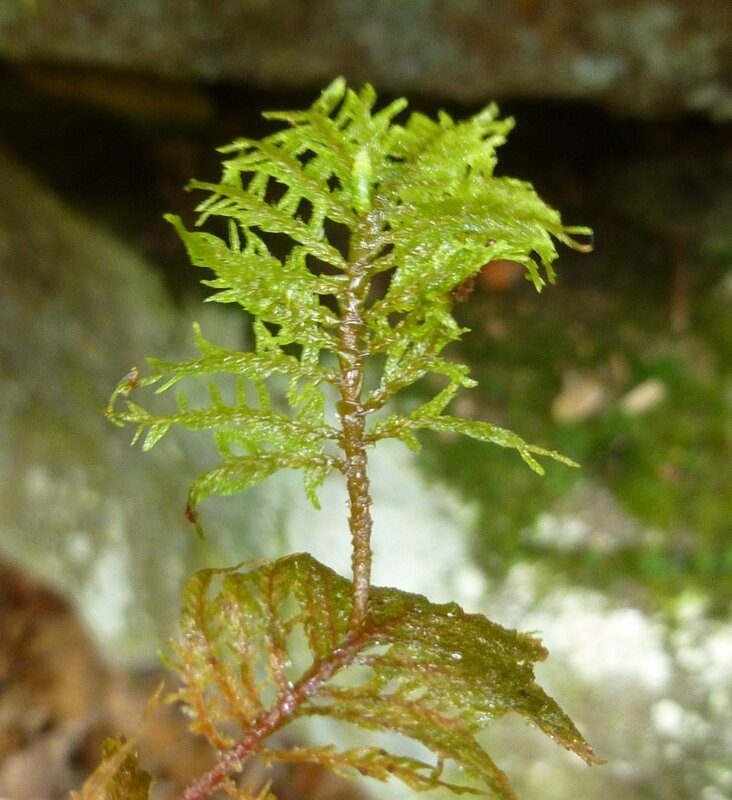 Fern allies are “seedless vascular plants that are not true ferns, but like ferns, disperse by shedding spores.” Mosses don’t fit this description because, though they produce spores, they are not vascular. Club mosses fit the description perfectly and are called “club” mosses because their fruiting structures (strobili) are club shaped. These club shaped, cone-like structures are where the spores are produced. 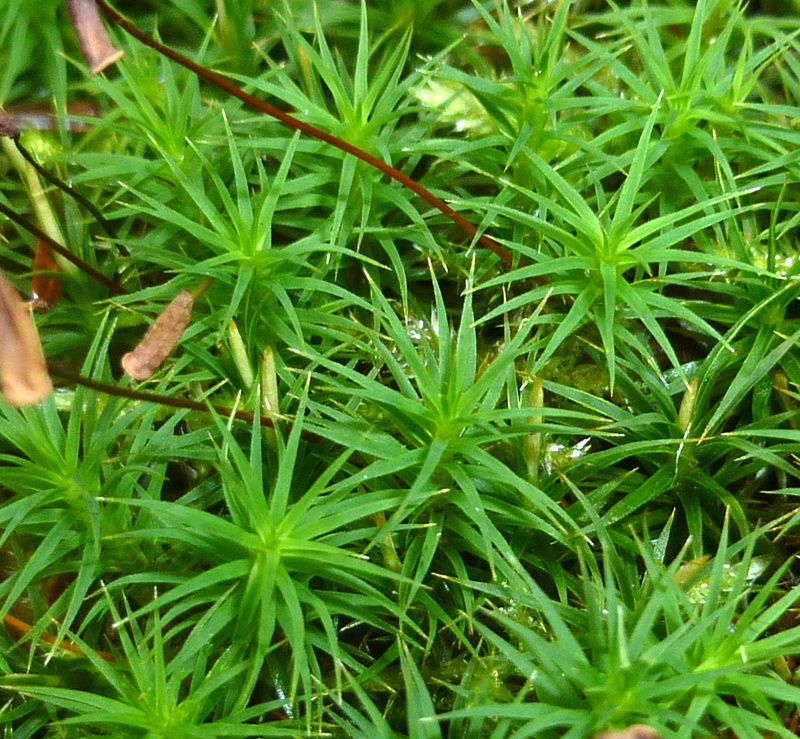 The club moss in the photo, known as fan shaped club moss (Diphasiastrum digitatum), doesn’t have any strobili showing. In fact, as I was choosing the photos for this post I realized that I have never seen this club moss in its fruiting stage. Another club moss that I have never seen fruiting is running club moss (Lycopodium clavatum). This plant gets its name from the way it sends out long, horizontal stems. All along the horizontal stem erect stems form at intervals and roots form where it touches the ground. 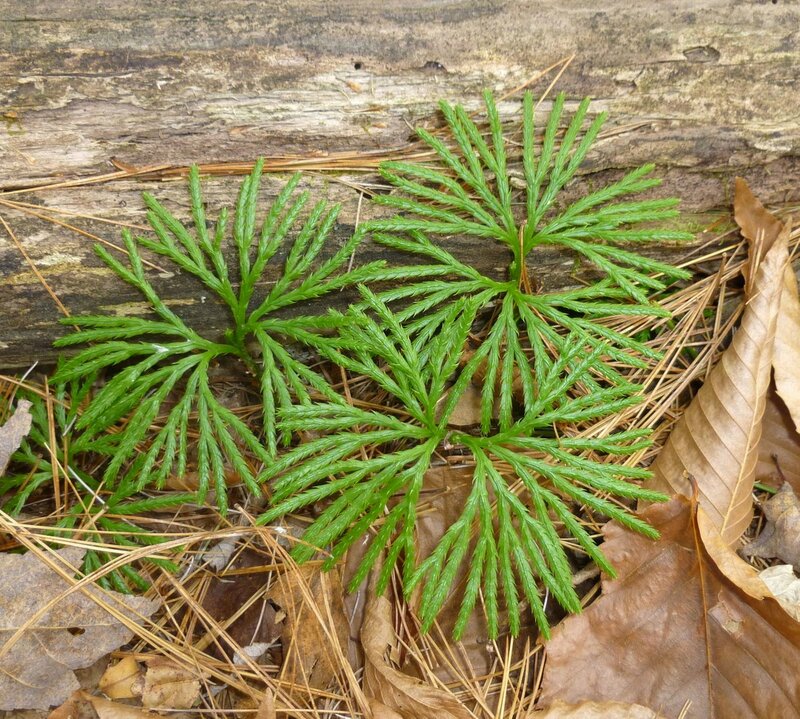 I had to brush the leaves away from the horizontal stem so we could see it, because when it’s buried it’s difficult to tell this club moss from others. I can’t say that these plants are rare here, but I don’t see them too often. Baby tooth moss (Plagiomnium cuspidatum) doesn’t look like a moss at all to me, with its long, vining habit and (relatively) large leaves, but it is one. 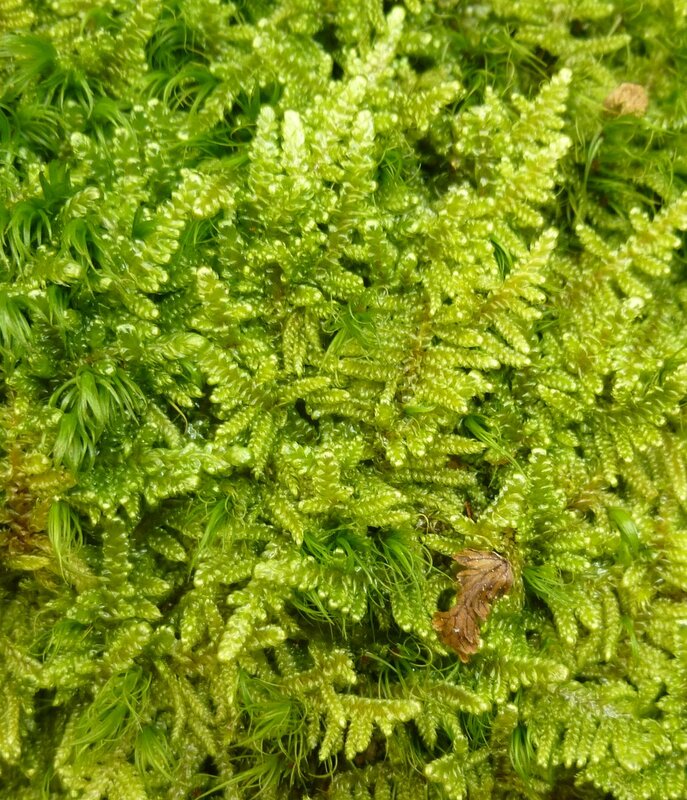 Though far too small to be seen in the photo, this moss gets its common name from the way the upper margins of the leaves are toothed. The cuspidatum part of the scientific name comes from cuspid, which comes from the Latin cuspis and which means a tooth with a single point, like a canine tooth. It is said that this moss is very common in eastern North America, but I can’t remember ever seeing it before I took this photo. It grows in moist hardwood forests on stones, logs, or soil. Brocade is a “heavy fabric interwoven with a rich, raised design” and that description really fits brocade moss (Hypnum imponens), which always looks to me like it was embroidered by elves or some other forest dwellers. 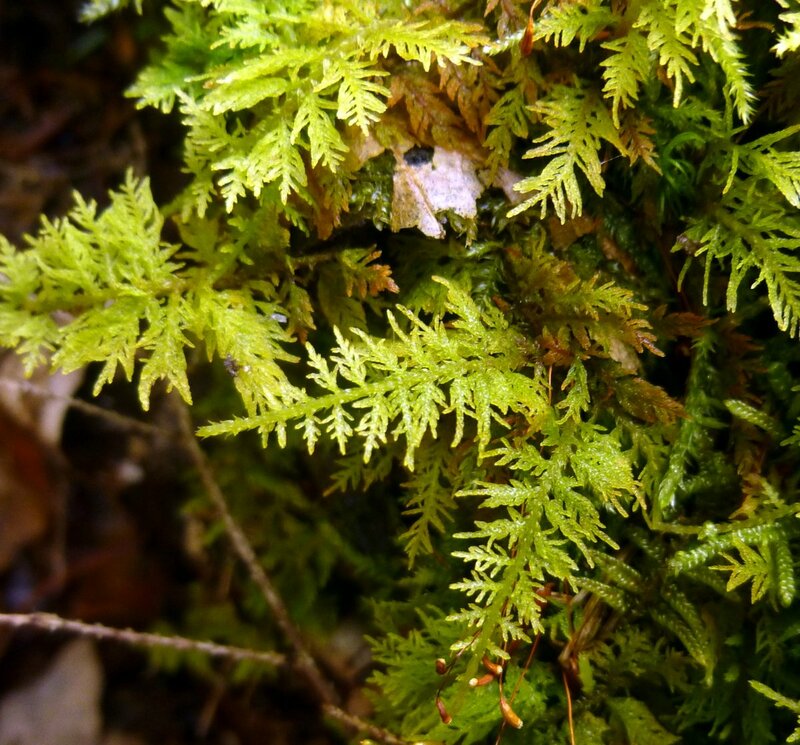 This moss, with its orange, yellow, and brown highlights and fern or feather like shape is one of the easiest to identify. 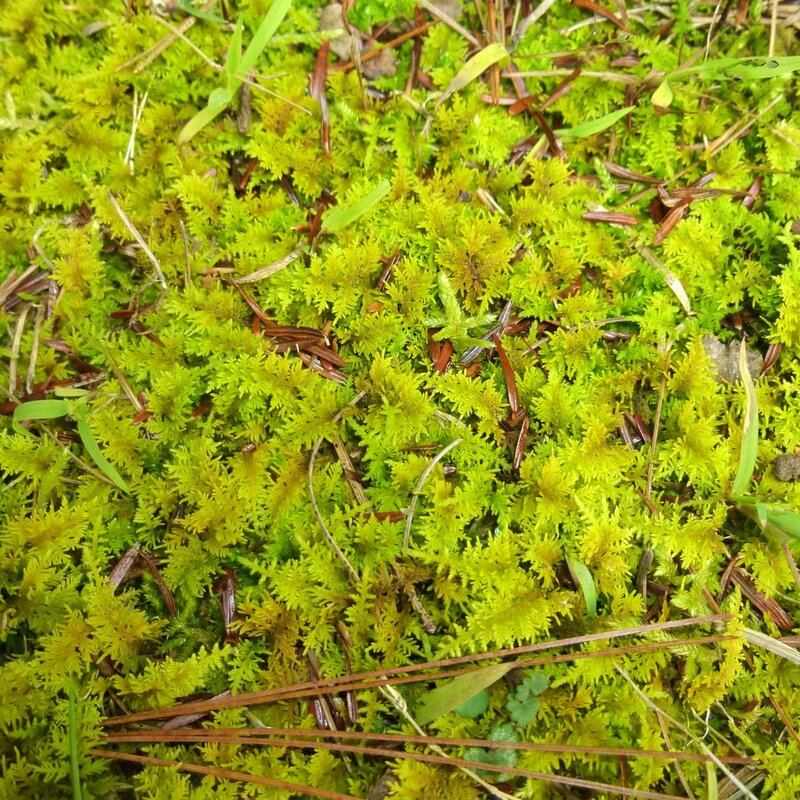 It forms dense mats on moist ground. 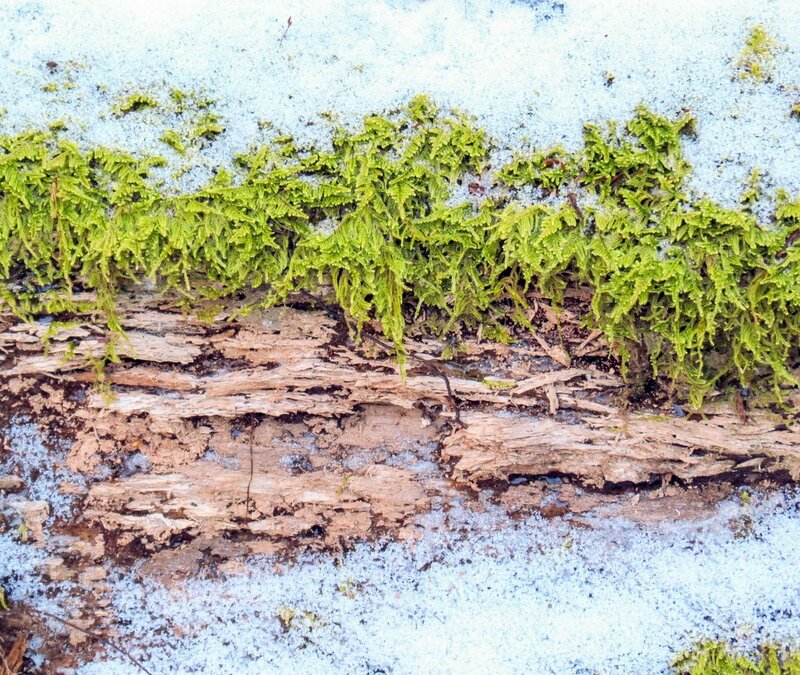 This moss was once used as stuffing for mattresses and pillows and the Hypnum part of the scientific name comes from the word Hypnos, name of the Greek god of sleep. 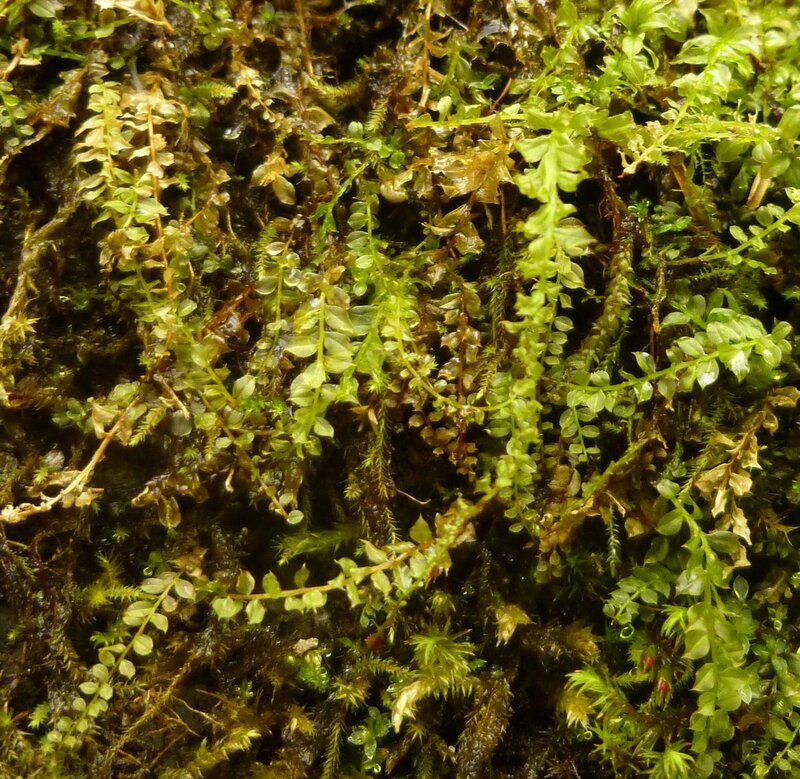 A good example of why botanists use scientific names instead of common names is this moss, Rhytidiadelphus triquetrus. 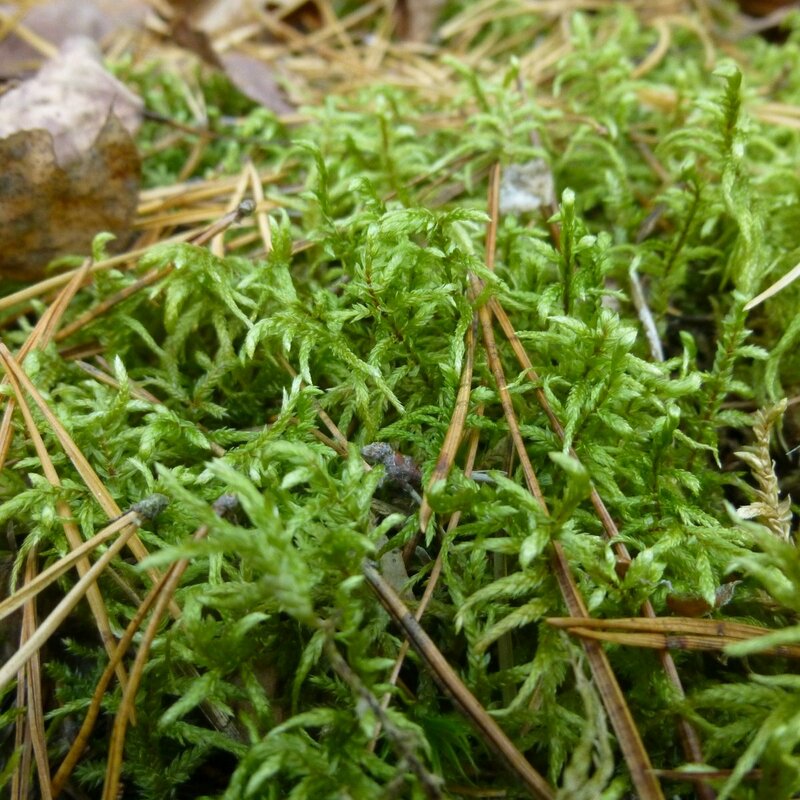 Its common names are shaggy moss, plaited shaggy moss, big shaggy moss, rough goose neck moss, rough neck moss, and even electrified cat’s tail moss. I kid you not. Apparently someone thought that if you somehow plugged in a cat its tail would look just like this moss. When I saw how pale this yellow feather moss (Homalothecium lutescens) was I thought it was sick, but this is the way it is supposed to look. It has kind of a loose, airy look that I like. It’s also called ragged yellow moss and fossil evidence has been found that dates it as far back as the Pleistocene epoch, from about 2,588,000 to 11,700 years ago. Have you heard about Punxsutawney Phil, the weather predicting ground hog? 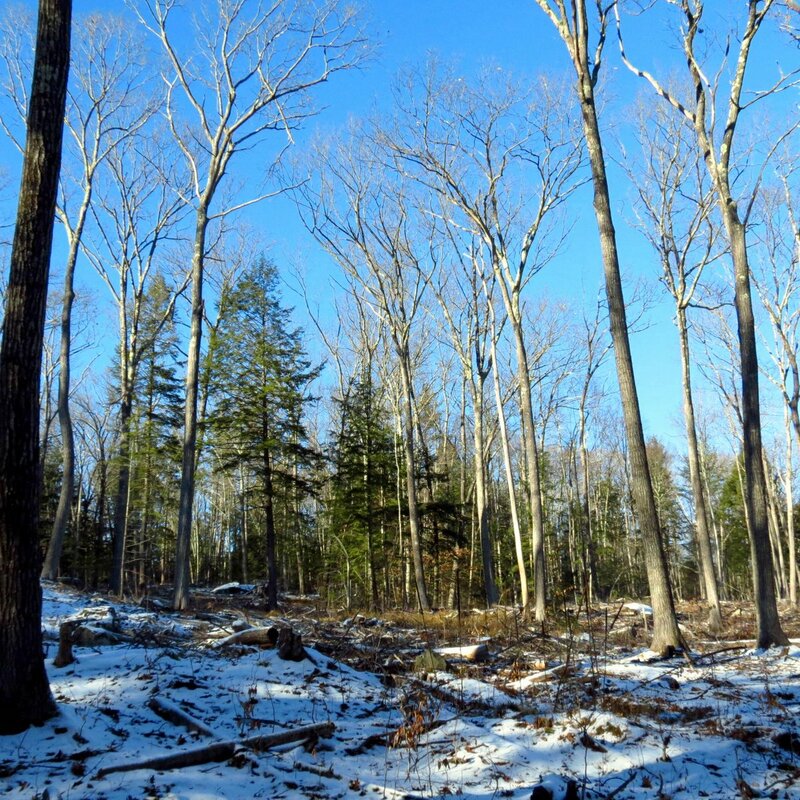 He has been indicted in Ohio for fraud because of his “misrepresentation of spring.” The indictment alleges that he acted with “prior calculation and design” to cause people to believe that spring would arrive early. Exactly-spring like temperature spikes followed by winter like temperature dips. Or, two steps backward for every step forward. 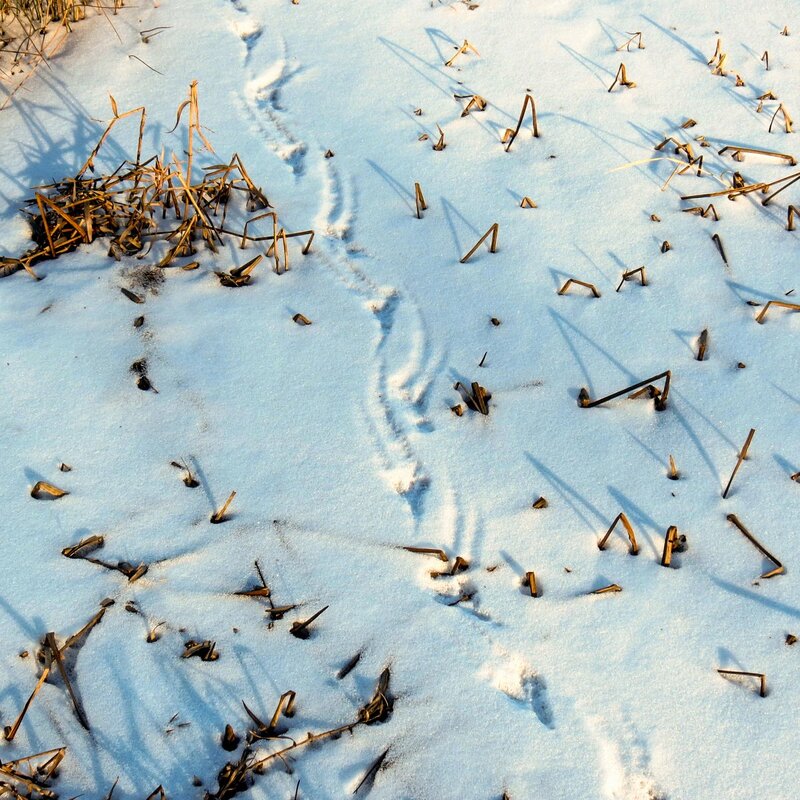 Historically, the rodent’s predictions are accurate only 30% of the time, so we have only ourselves to blame if we jumped for joy at his early spring prediction this year. Cincinnati prosecutor Mike Gmoser doesn’t see it that way though, and is calling for the death penalty, citing “aggravating circumstances.” Here is a man who is obviously very sick of winter! I wonder what he’ll do about the National Climatic Data Center and the National Weather Service-who also called for an early spring. 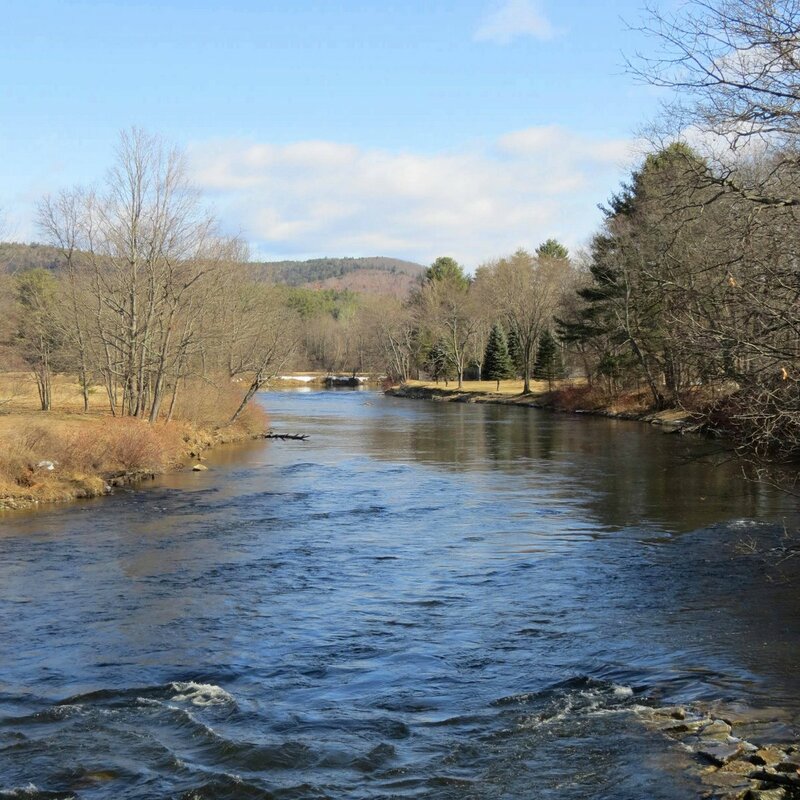 This is what the Ashuelot River looked like on Saint Patrick’s Day, March 17th. Nice and spring-like. 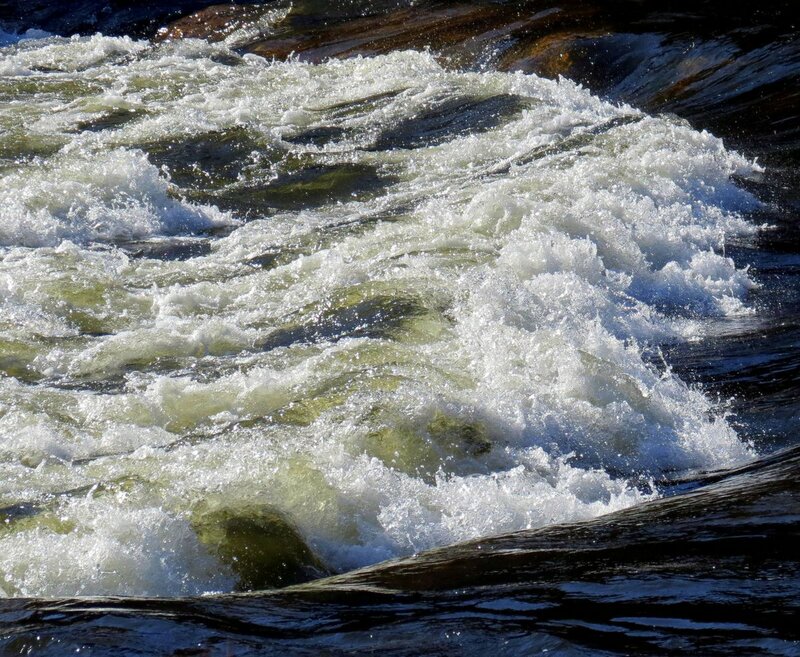 The river was so happy to see some sunshine that it was chuckling and pretending to be the ocean. 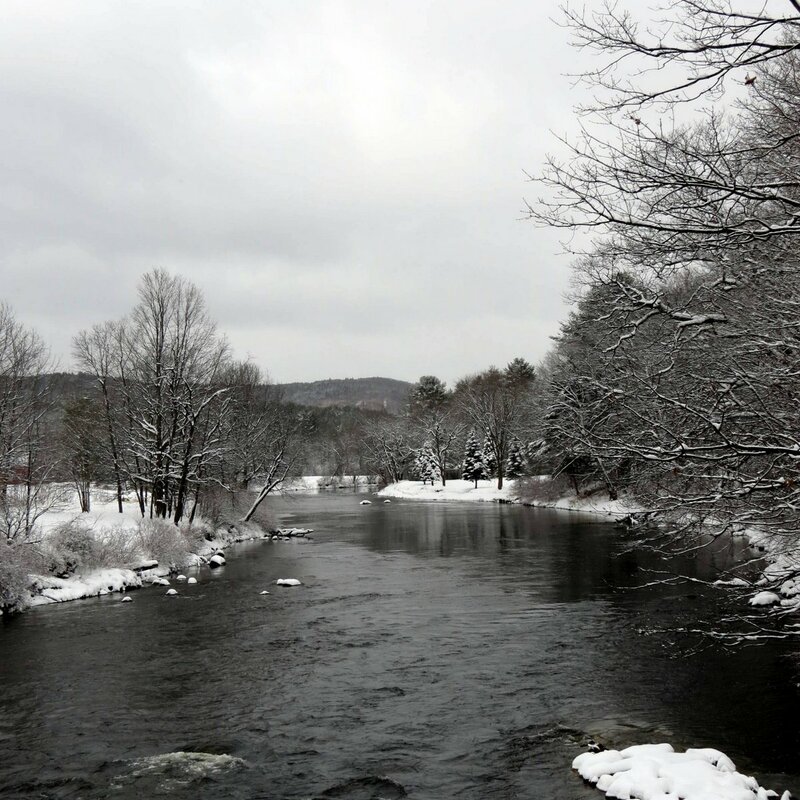 Here is what the river looked like 2 days later on Tuesday, March 19th after about 9 inches of snow fell. (This shot is in color.) 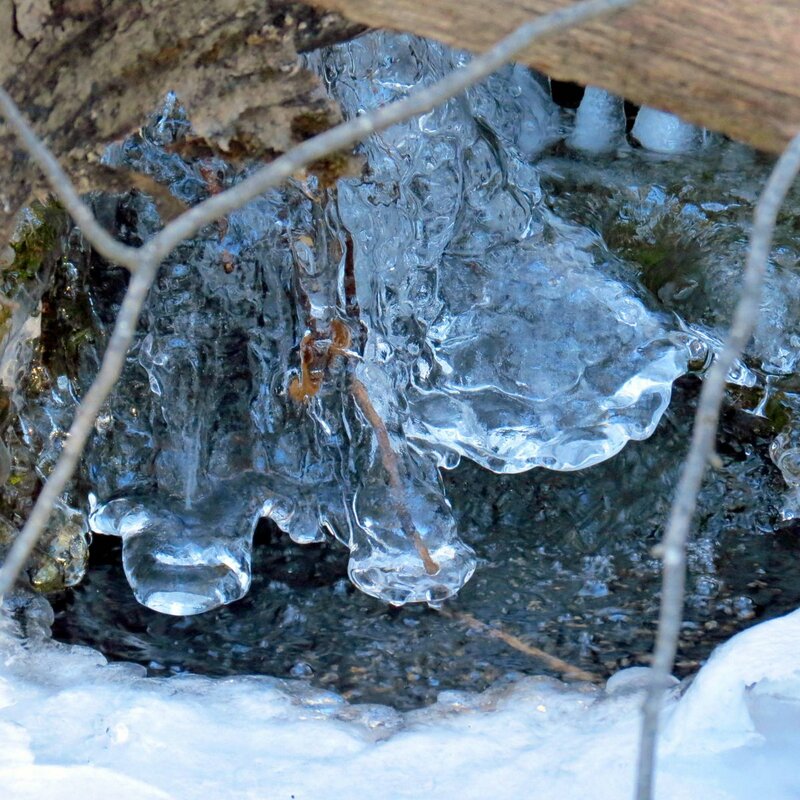 Oh well, the temperature is above freezing each day so it is all melting away again, slowly. 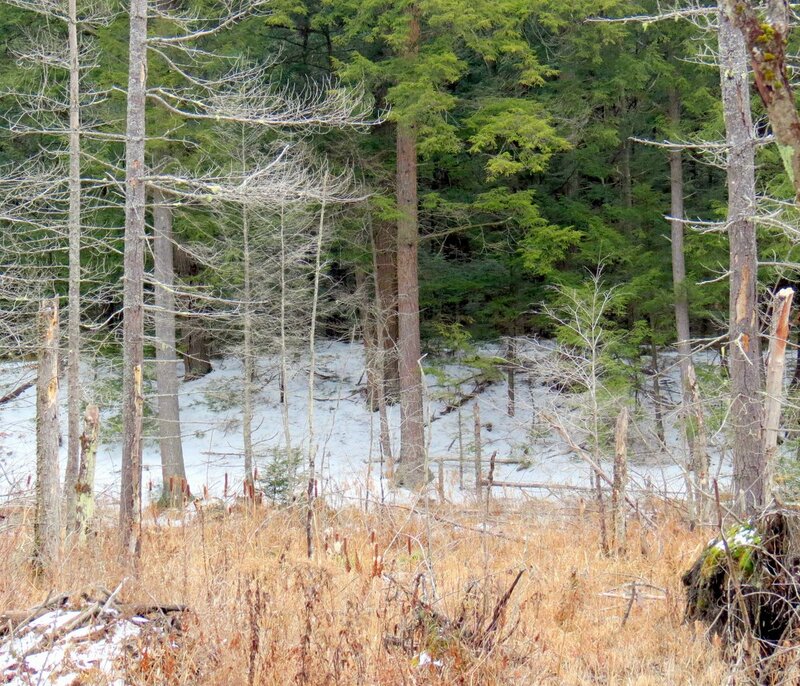 Fortunately, I had spent some time in the woods before it snowed. The dusty rose-pink leaves of our native heart leaf foamflower (Tiarella cordifolia) will soon turn green, but for now they really stand out among the brown leaves and snow on the forest floor. This plant loses its green color in the fall when other leaves are changing, but it hangs on to its leaves all winter, green or not. It gets its common name from the shape of its leaves and from the many small white flowers that look like foam. Brocade Moss (Hypnum imponens) forms extensive mats and looks as if it has been embroidered on what it is growing on. 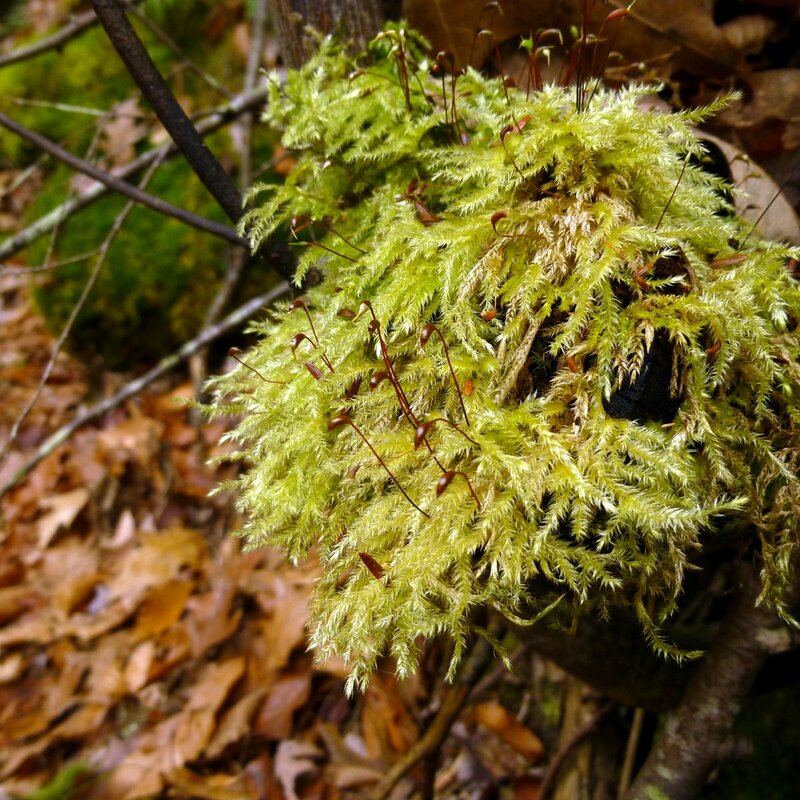 This moss is easy to spot due to its greenish golden color along with yellow and orange highlights and rust colored stems. A close look at the small, overlapping leaves shows that they look like they have been braided along the stem. This moss likes moist areas. Common gold speck lichen (Candelariella vitellina) grows just about anywhere, but I usually find it growing on parts of stones that don’t receive any direct rain. 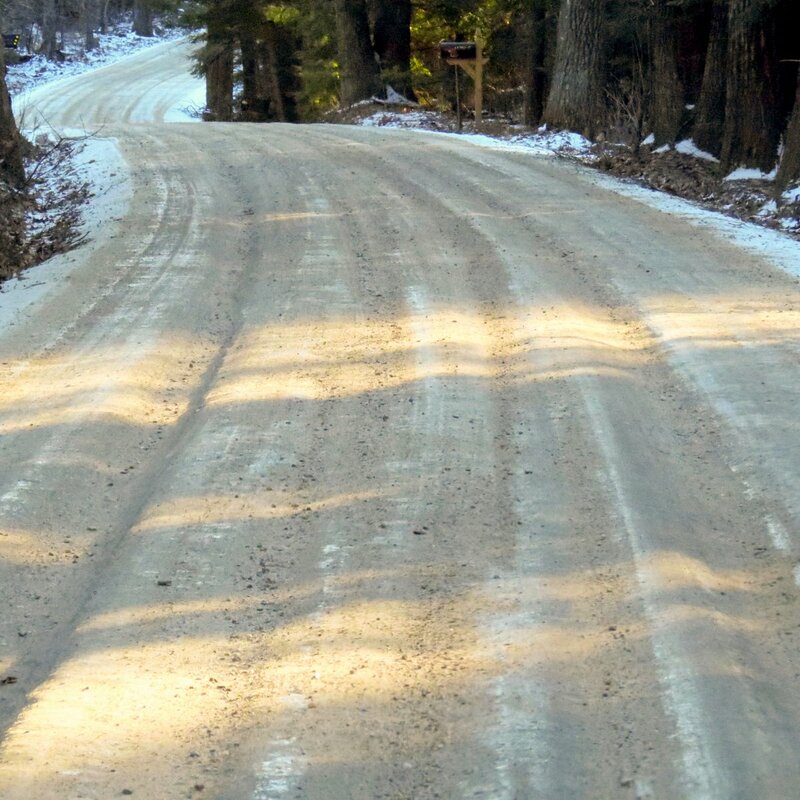 Some say its color resembles egg yolks and others say powdered mustard. It looks pale, sulfur yellow to me, and sometimes looks a little green. 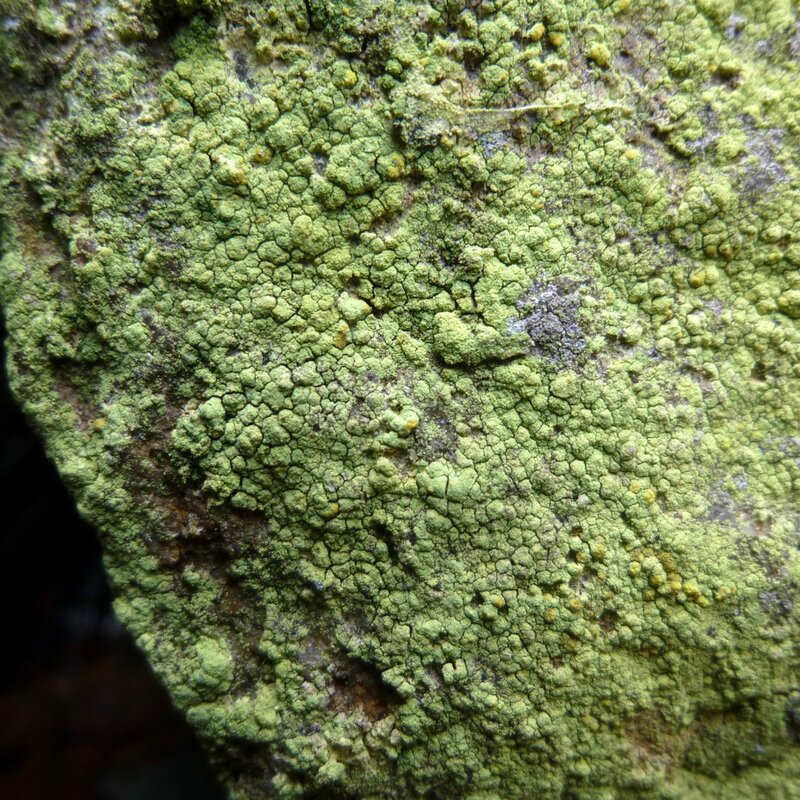 This is a crustose lichen which grows like a crust on its substrate. Common gold speck lichen is easy to spot growing on stone walls. This picture shows how it grows in sheltered places that aren’t likely to receive any direct rain. I found this golden moon glow lichen (Dimelaena oreina) growing on polished granite in full sun. It was small-no bigger than a dime-but noticeable because of the way the dark, disc shaped fruiting bodies (Apothecia) in the center shade into the greenish yellow outer edges. 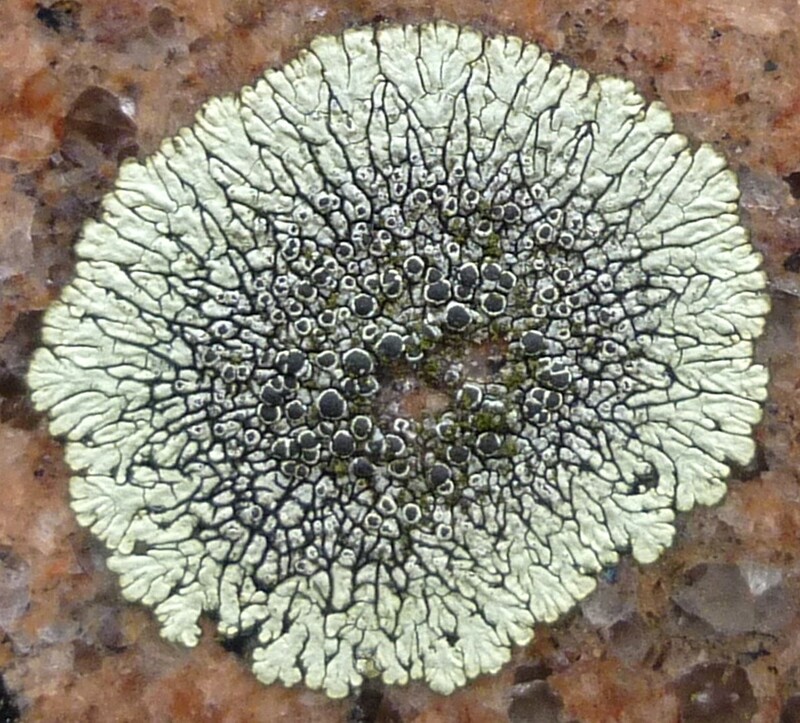 One unusual aspect of this lichen is its squamulose form. A squamulose lichen falls somewhere between the leafy foliose lichens and crusty crustose lichens and has “squamules,” which in this case are the tiny, curled lobes around its outer edges. 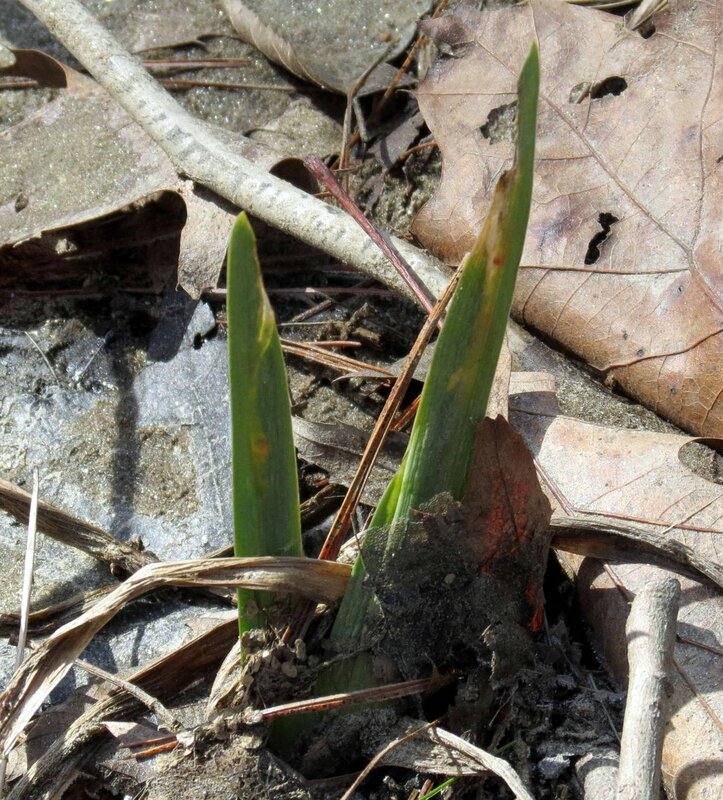 Native blue flag iris (Iris versicolor) shoots were green and growing along the river bank before the snow fell. This is a tough plant so it’s doubtful that snow will hurt it. The flowers have 3 sepals and 3 petals and are deep blue (sometimes purple) and showy with yellow or white highlights at the base of the sepals. This plant was very valuable medicinally to Native Americans and it is said that many tribes grew it close to their villages. 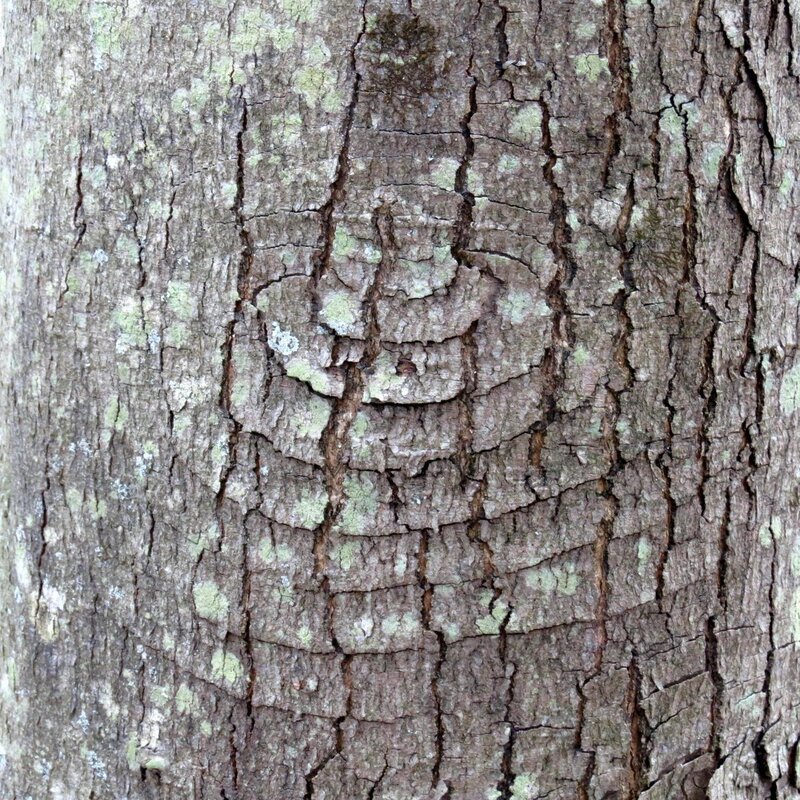 Last year I saw a maple tree with this circular pattern repeated in the bark all up and down the trunk. This year I found the same pattern on a different tree. 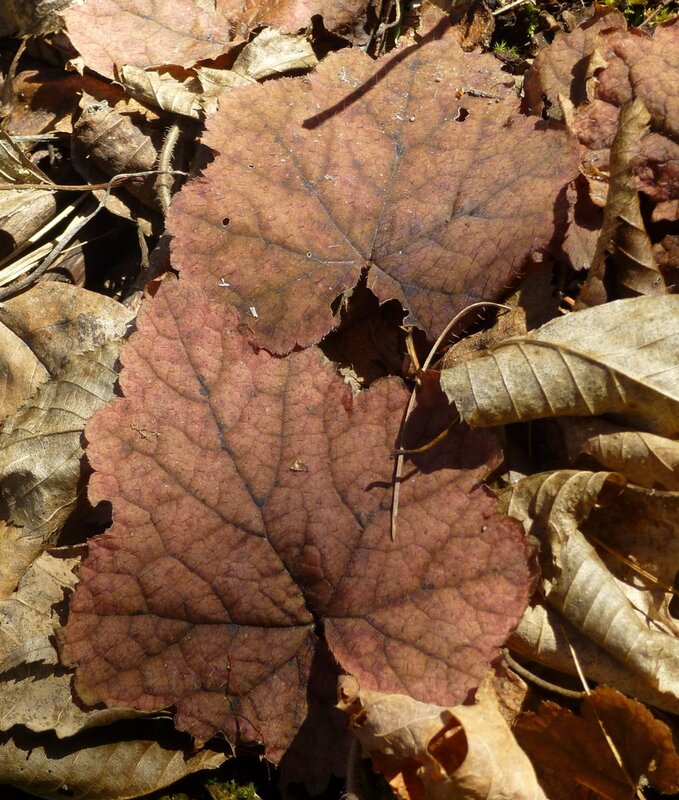 After a year of searching books and websites I finally found a naturalist who identifies these circular patterns as normal markings on young red maple trees (Acer rubrum.) As the tree ages the circles are obscured by other lines and ridges. 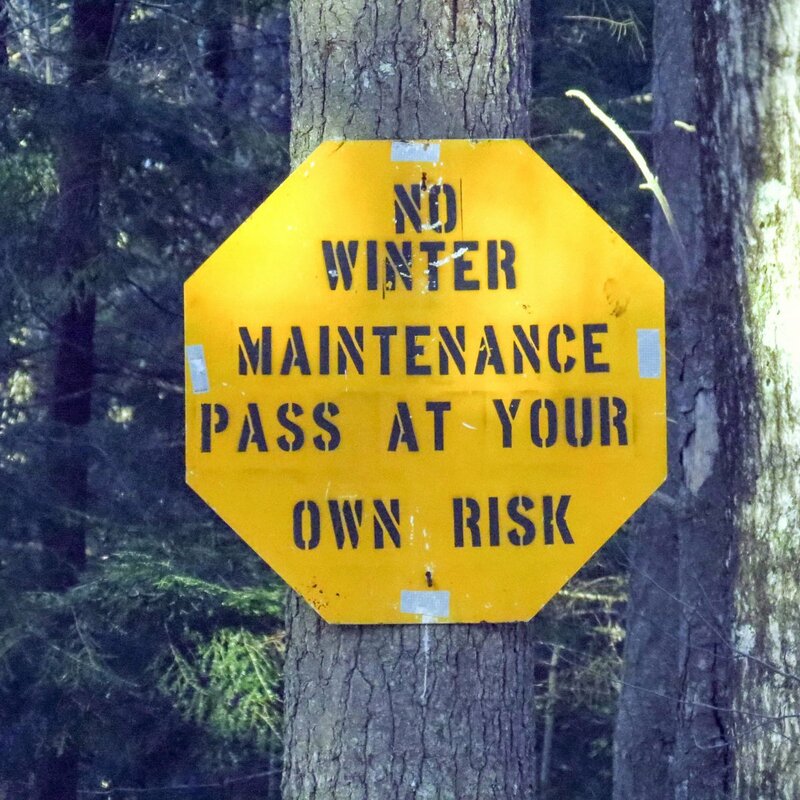 My question is: After decades of roaming in the forest why have I only seen this twice? When it comes to thorns the honey locust tree (Gleditsia triacanthos) has to be king of the forest in this area. The three pronged thorns on these trees are hard enough to pierce before they break off. They can be 6 inches long or more under optimal conditions and are very sharp. 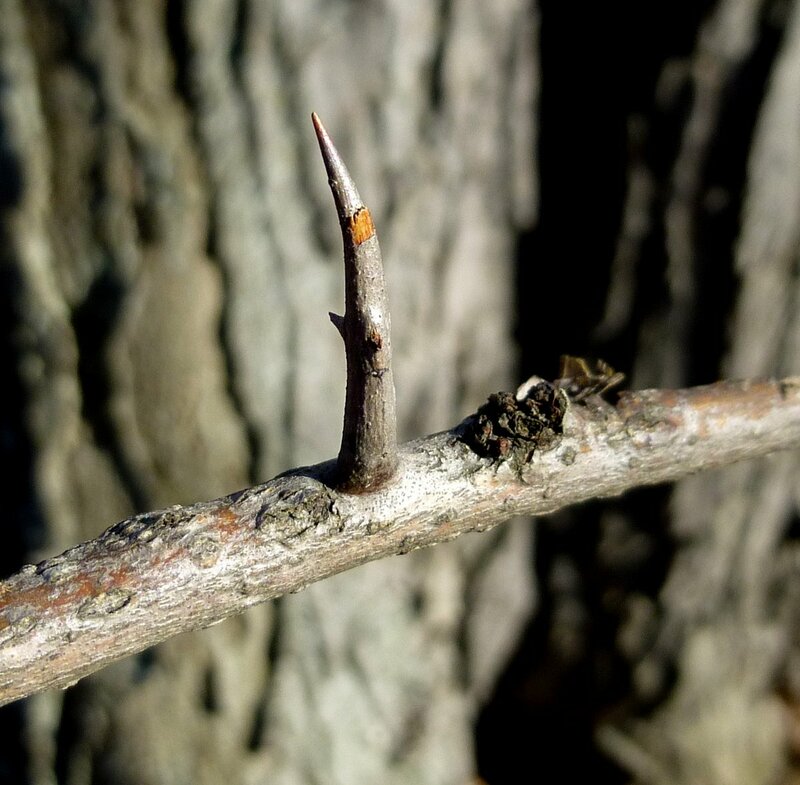 During the Civil War Confederate soldiers used the thorns to hold their uniforms together, which led to the common name of Confederate pin tree.